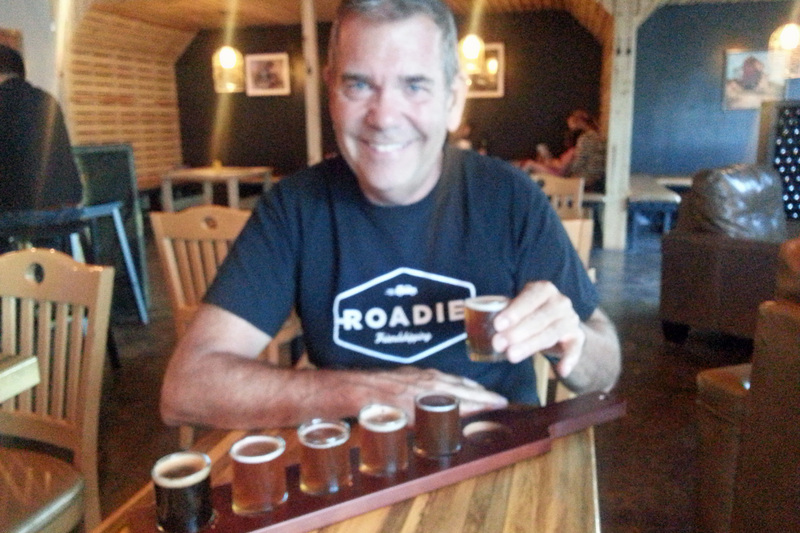 Pictures and comments on our “road food” and our craft brewery discoveries as we travel about. Bon Appetit! (I must admit that I love all kinds of food and find it hard NOT to like everything, but some eats are more special than others. Let me know about your favorites or places we might have missed). I posted some comments in our blog and also did some reviews for TripAdvisor, which I will copy here. Overall, we loved these beach spots and think you will, too (the blog post Panama City has hyperlinks). 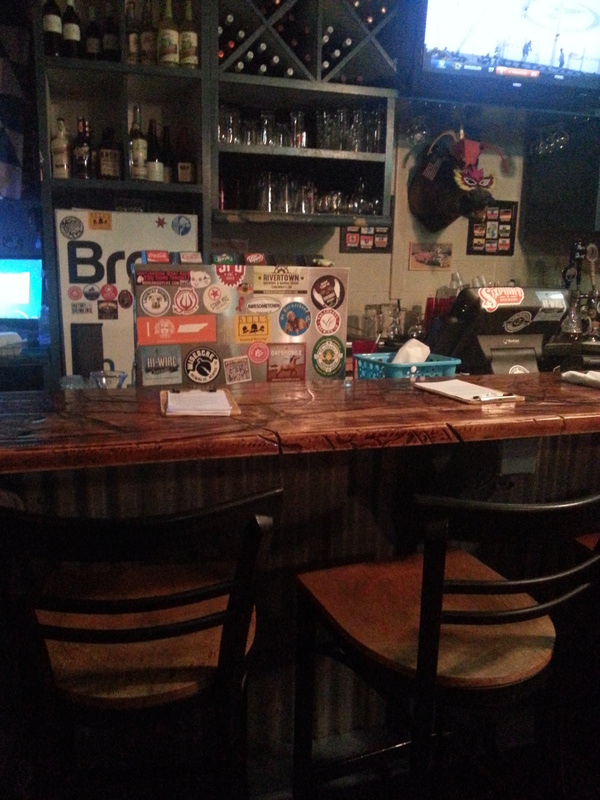 Popular spot for locals, with a nice patio bar, music and good selection of craft beer. Downside is shortage of parking and small bathrooms. Otherwise good basic beach bar, though not on beach directly. Fish tacos were good, nothing special. Beach visit with family was perfect with dinner at Sharkey’s. 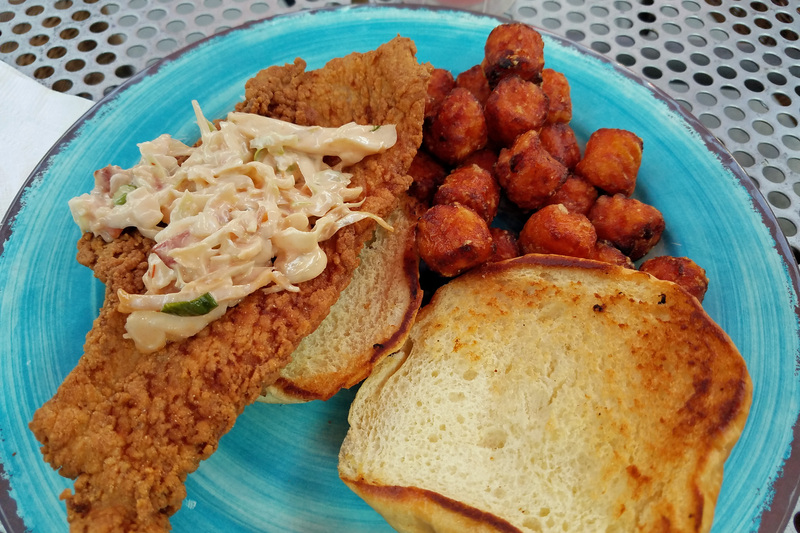 Our third time at this great beachside spot and our hands down favorite is the fried grouper sandwich. Plan to wait a bit for a table, and cross your fingers for a table beach-side. Frozen drinks hit the spot and the large cups have cheaper refills. Parking can be tricky, try the lot across the street. Stopped at Hammerhead Fred’s because we had a refill cup from a previous dinner at Sharky’s and wanted to check out their vibe. Table was great, service was friendly and prompt and the signature drink was refreshing. 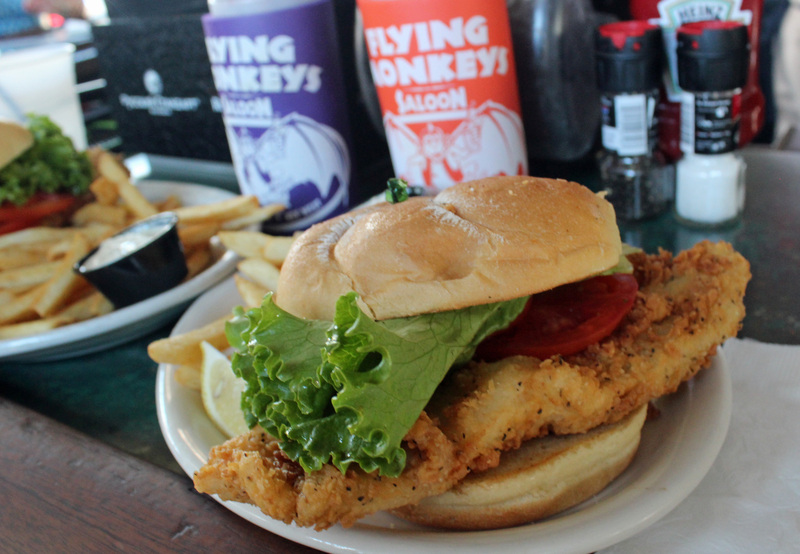 We ordered our go-to sandwich in PCB: grouper. 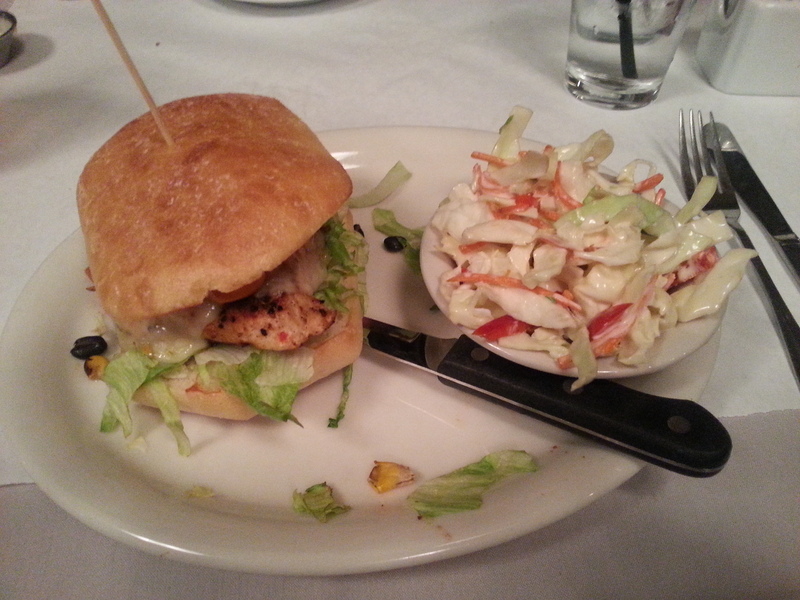 Fred’s is called the Goombay Grouper sandwich and it is served on a tasty, toasted bun with thousand island bacon slaw. We had sweet potato tots on the side. The fish was good, might have wanted a bit more slaw, but by adding some tarter sauce we got it a bit juicier. Finished off with a slice of key lime pie, something we don’t usually do, but the sandwich left room for desert. Prices for drinks and food were just a bit more than a few other spots we visited, but not unreasonable. Portions were adequate, not overstuffed. While it isn’t beachfront, the restaurant has a huge pavilion feel, with live music and plenty of seating. We noticed many bar-top tables suitable for large groups and families. 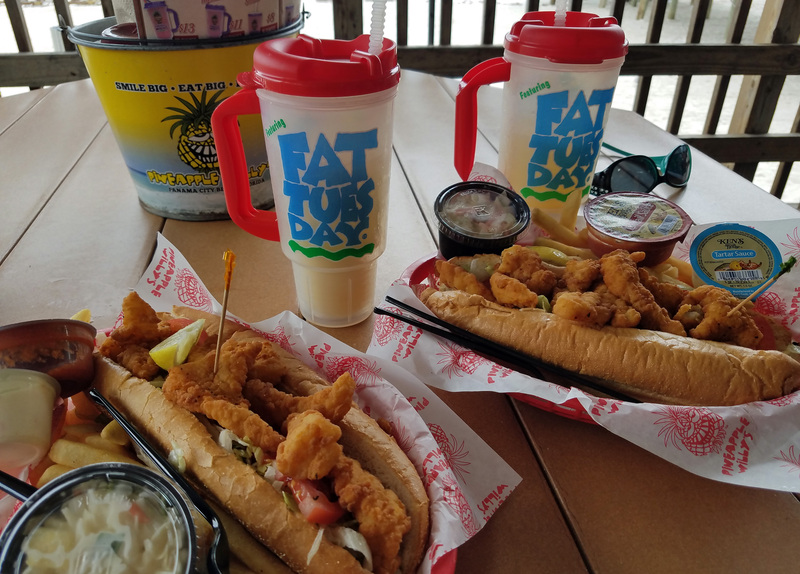 Although we are big fans of craft beer, and Fred’s has over 50 on tap, we recommend buying the refillable cups that are good at Fred’s, Pineapple Willy’s and Sharky’s for cheaper refills (each of which we tried). On a rainy day at the beach what better to do than hit a beach bar for drinks and lunch? 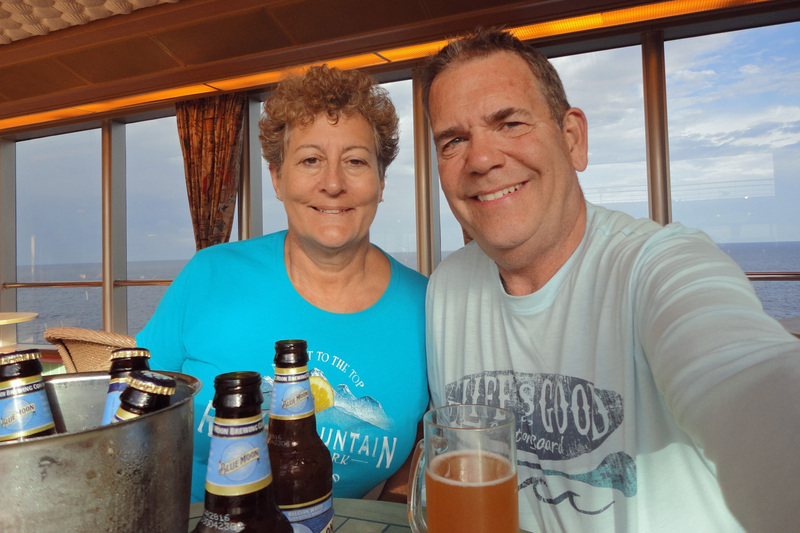 We brought along our plastic beer steins (from a previous dinner at Sharky’s) for a refill (cheaper) of Pineapple Willy’s (three rums, pineapple juice and deelish) and sat at a table on the rail along the beach. 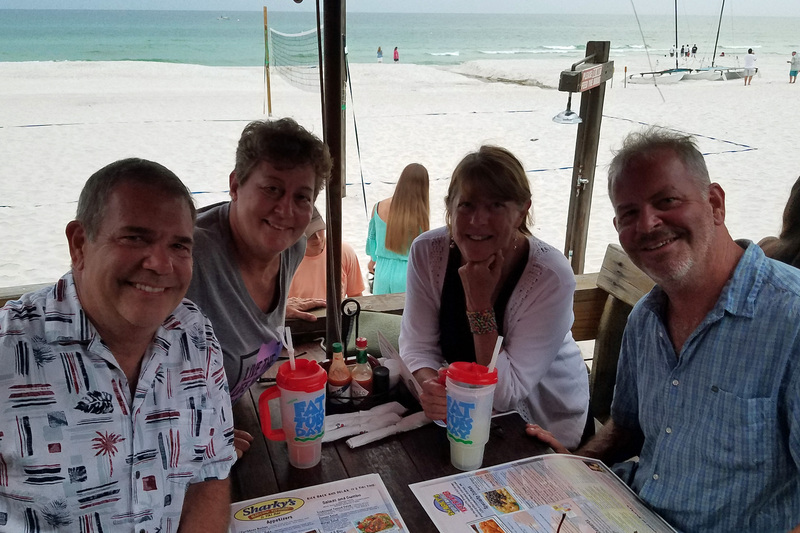 Since the restaurant is on the site of the original Panama City Beach Pier, they have a bit of pier with dining tables that extends to the water — quite the treat. We wanted fresh fish, so we ordered Fish Po’Boys and lucked out with grouper as fish of the day. These were the BEST Po’Boys ever. The roll was light but just chewy enough, stuffed with chunks of fried grouper atop lettuce and tomato … yummy and ‘huuuge’ portion. Pineapple slaw was a great side, too. Reasonable price for the meal. We enjoyed lunch with my brother and sister-in-law here while camping in St. Andrews State Park. 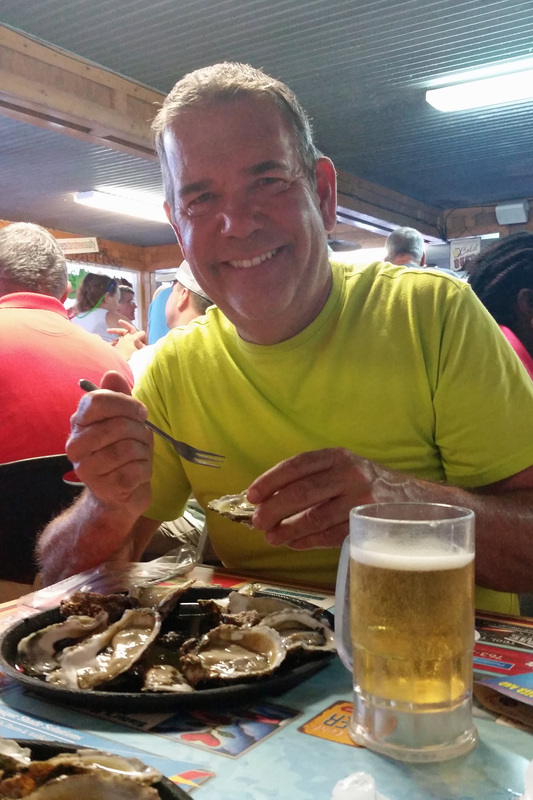 After a morning of snorkeling we docked in the marina and walked across the street to have some cold beer and fresh shucked oysters. What a great spot! Two dozen raw oysters made it to our table before the beer. 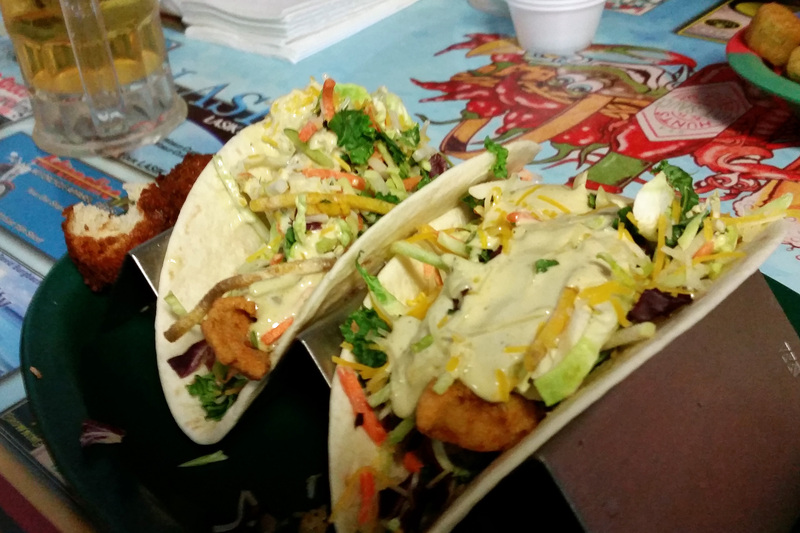 We also had the fish tacos, which were amazing. Highly recommended if you are nearby. 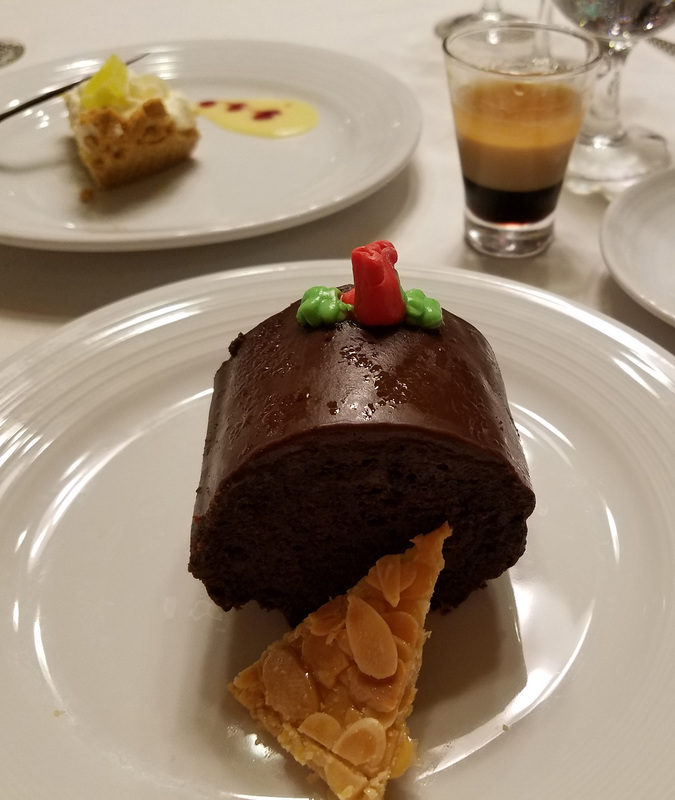 Yule log (bûche de Noël), with a side of Key lime pie and dessert shot. If you read about our family’s December cruise to Nassau and Key West on Royal Caribbean, you know we had a great time celebrating Dad’s 90th birthday. 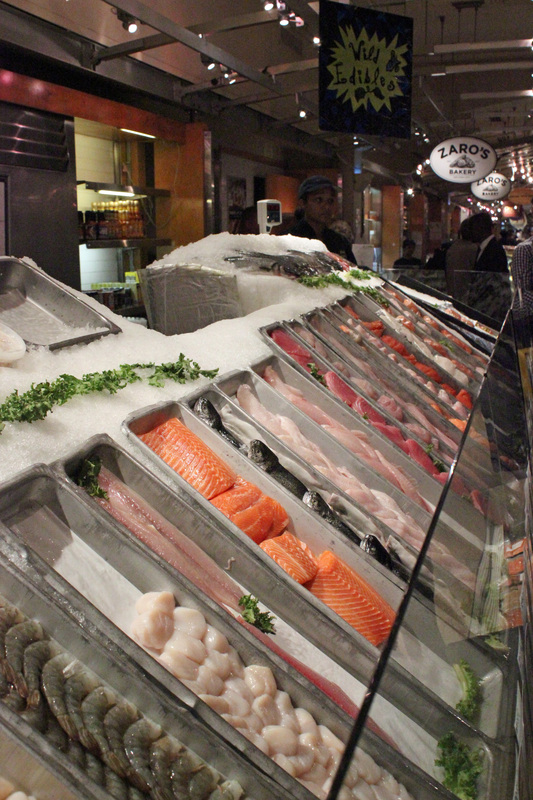 Our food selection in the main dining room each night was wonderful. 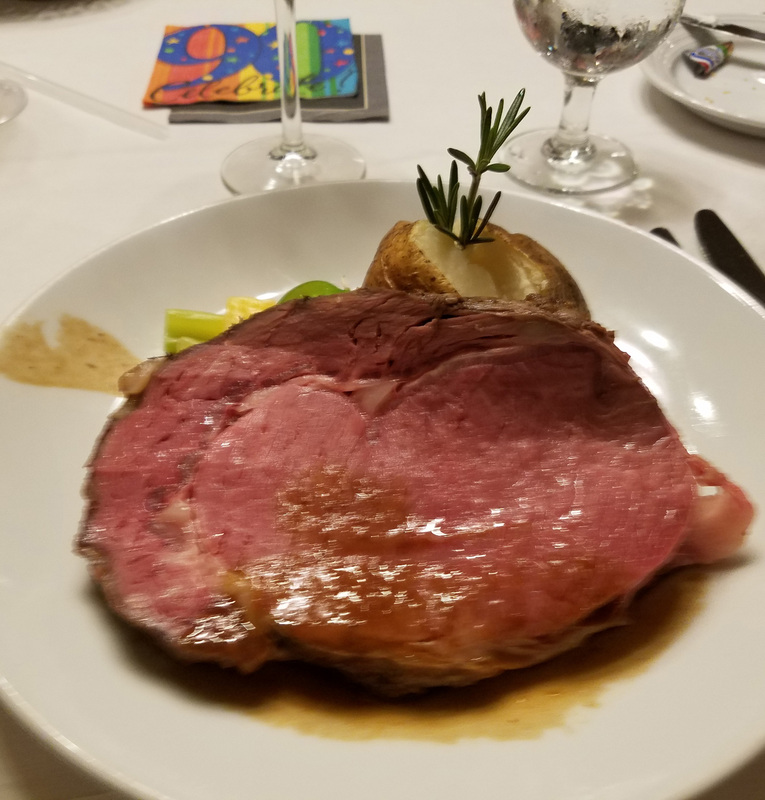 As you can see, the prime rib was served medium-rare, as requested, and later in the week the lamb shank was served tender and delicious. The desserts shown are only a small sampling of what was consumed at our table … our server insisted that we have a “side” of Key lime pie on our last night, no matter what we ordered. 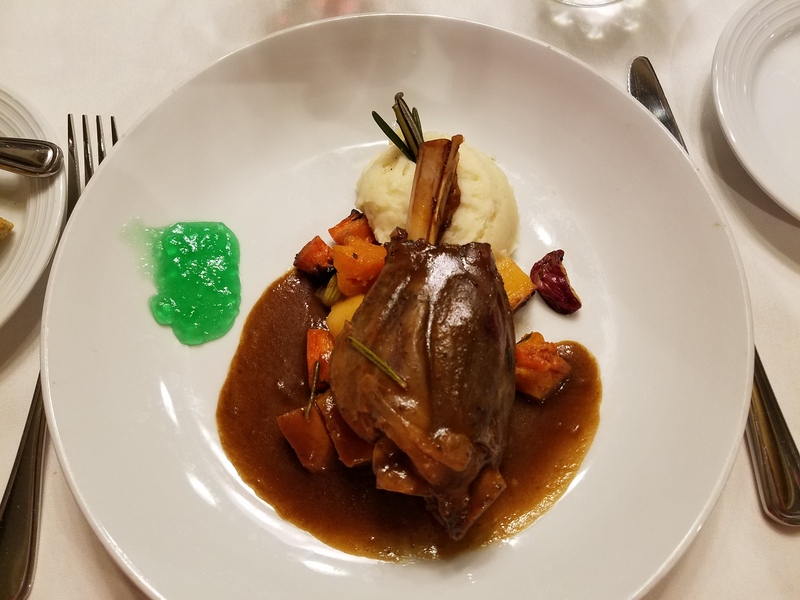 Some say the food selection on cruises can be mediocre unless you dine in the specialty restaurants onboard, but our experience in the main dining room was really great. No complaints from anyone! 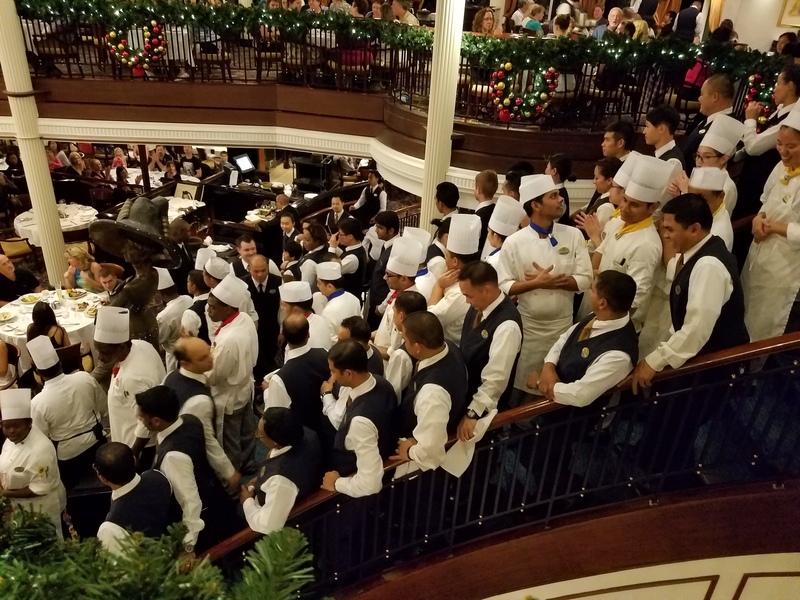 The kitchen and serving staff celebration on the last night was fun and you could feel the pride of all involved. Proud kitchen and serving staff! 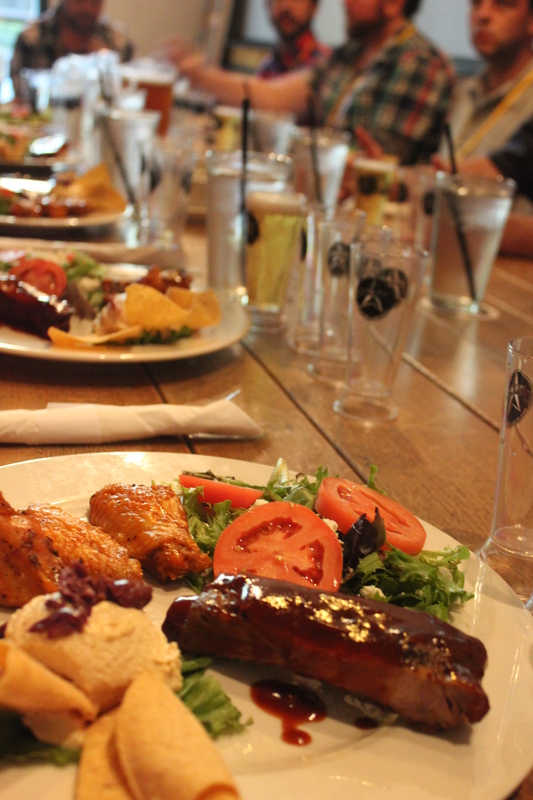 Stopped in Brewhaus with family on their recommendation and were delighted with the food and atmosphere. 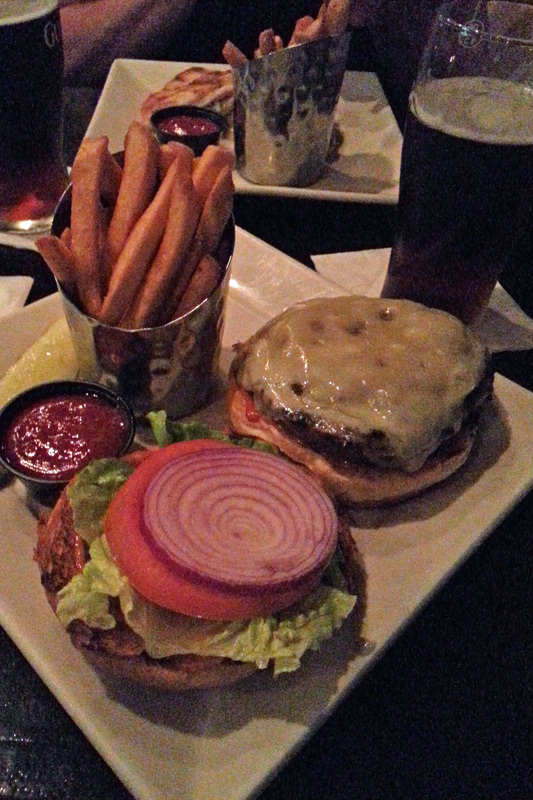 This gastropub had plenty of craft beer on tap and a nice blend of traditional German food with a Southern twist. We shared a plate of kraut balls (better version of sausage balls) and the pimento cheese with pickled beets and sourdough bread. 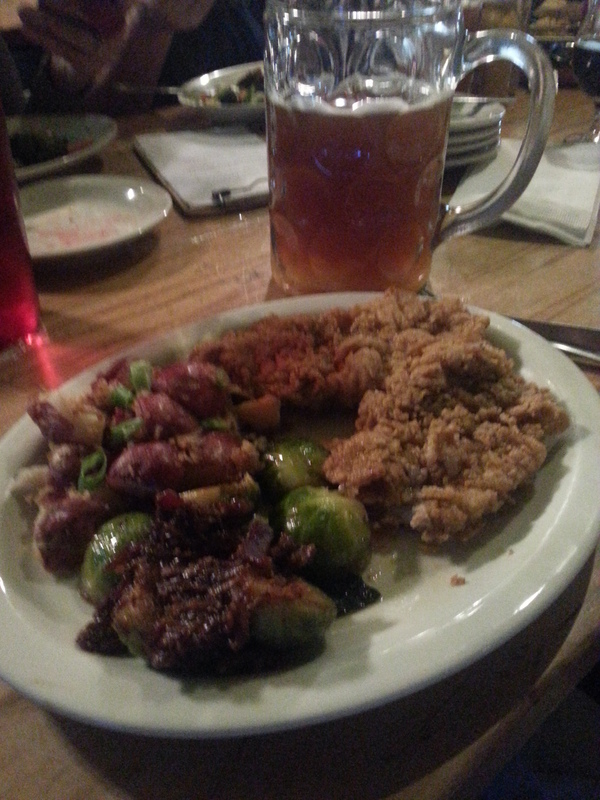 The veal wiener schnitzel was indeed pounded thin; the crunchy coating was more like chicken-fried steak. Red potato wedges made up the warm bacon and vinegar German potato salad that was a refreshing take on the traditional and the sauteed brussel sprouts were topped with a tangy bacon marmalade. Had to have a liter (yep!) of hefeweizen to wash it all down. Around the table everyone seemed to find a favorite, from curry wurst to potato cakes and brats. The atmosphere was casual and lively and we really had a great time. 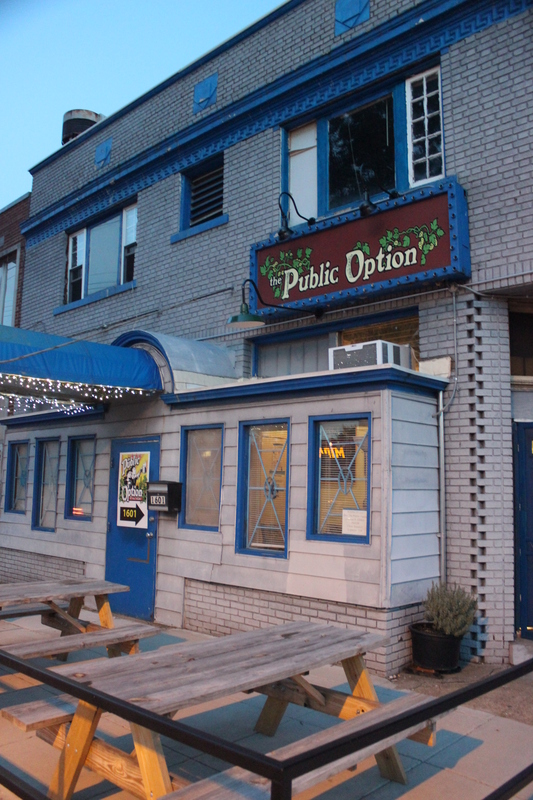 Chattanooga has so many choices for good food and beer, but I would definitely put this one on the list if you are in town — it is across the river from downtown in the North Shore area. 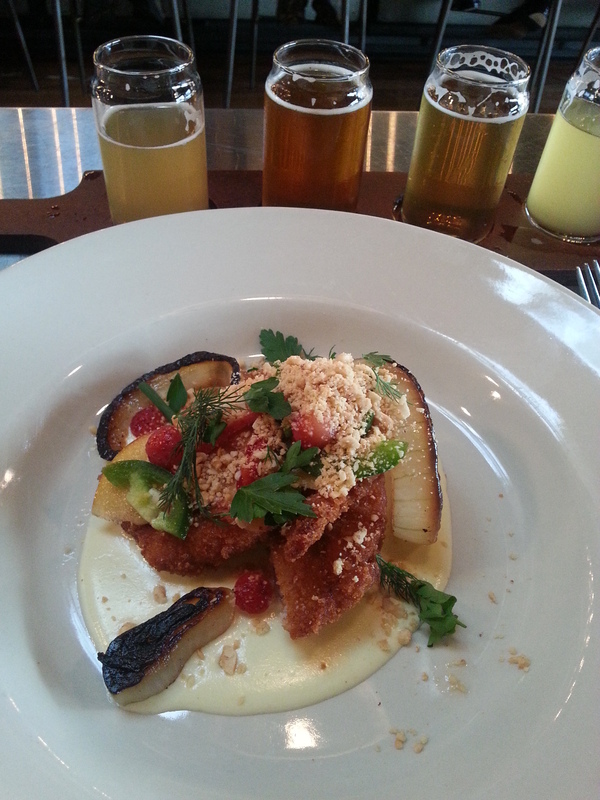 Pork schnitzel at Two Birds, with a flight of course. Two Birds Taphouse was a nice surprise this past weekend. The Marietta Square was buzzing with activity on a beautiful fall evening as they got ready for Chalktoberfest and finished up the homecoming parade for Marietta High School. Our good friends Dan, Terri and Barb (Blind Fate) were playing outside the Marietta Wine Market for the First Friday Artwalk (it really WAS a busy night). We listened for a bit and then wandered down the block to find this new hot spot just off the square. Two Birds has locally sourced organic ingredients and I think maybe I had traveled further to the restaurant than my food. 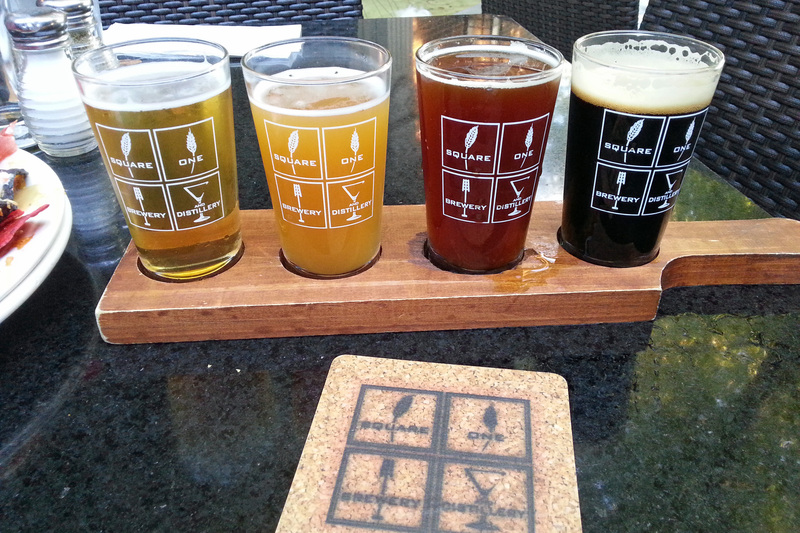 They had lots of local craft beer on tap, so a flight each was in order. Some of our samplings: Gate City 20 Grand, Creature Comforts Bibo Pils, Wicked Weed Pacificmost, Allagash White … there was a nice selection. For something to eat Jackie got their grass fed burger on a brioche bun (with yummy shoestring fries), I had the schnitzel with peaches & strawberries, jalapeno, charred sweet onion, peanuts, herbs and gouda fonduta. While it leaned more toward “fussy” than “hearty” it was nonetheless quite delicious. The breaded pork loin was tender, although I was expecting the more traditional pounded-thin pattie that I once had in Netherlands. 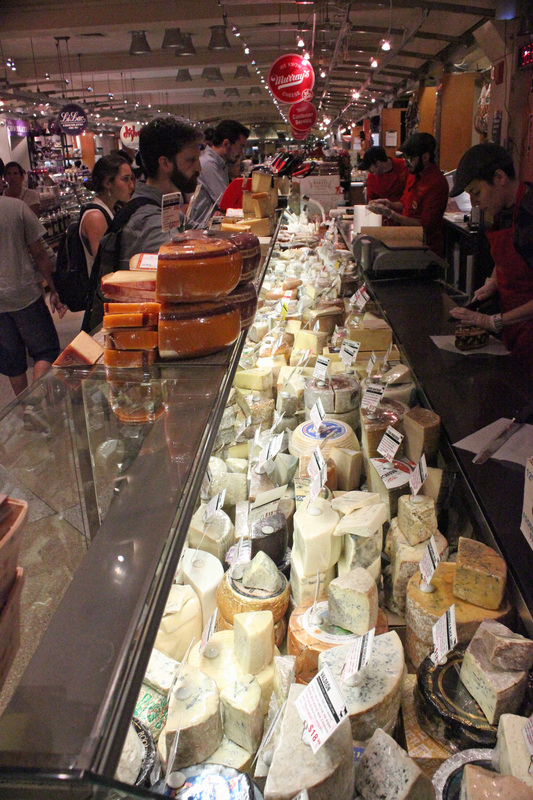 Great crowd and vibe – quite busy for only being open three months. I strongly suggest you grab some friends and try it out. 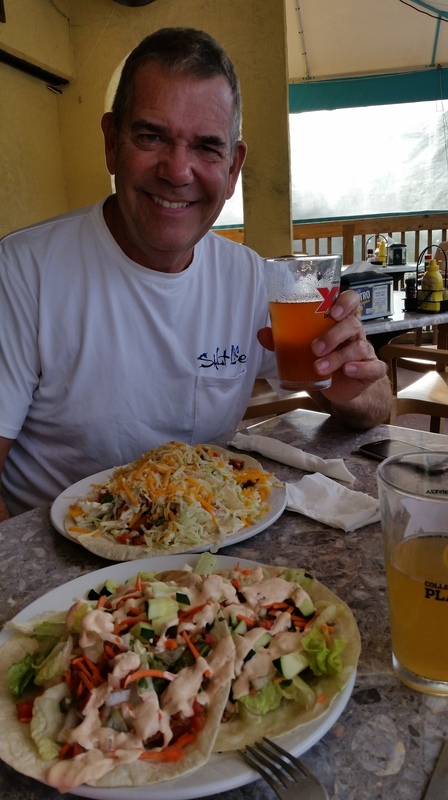 We had a great time driving and camping along the Florida Keys, always searching for good food and great craft beer. 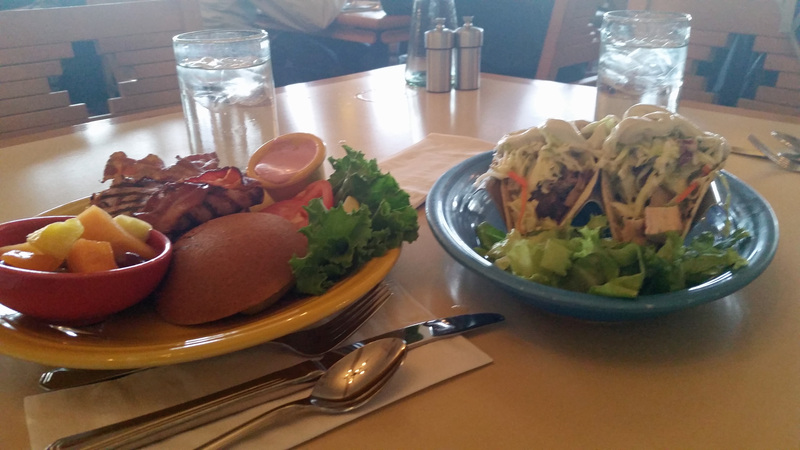 Kinda enjoy sandwiches, fish tacos and bar food instead of a typical steak dinner. 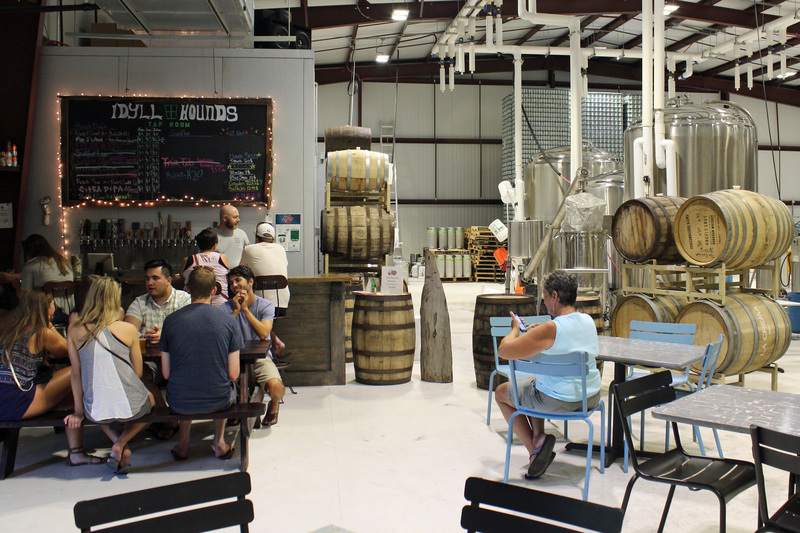 We learned that many of the South Florida beers are brewed further north, in the Brew Hub outside Lakeland or even in South Carolina. But we drank “local” as much as we could. 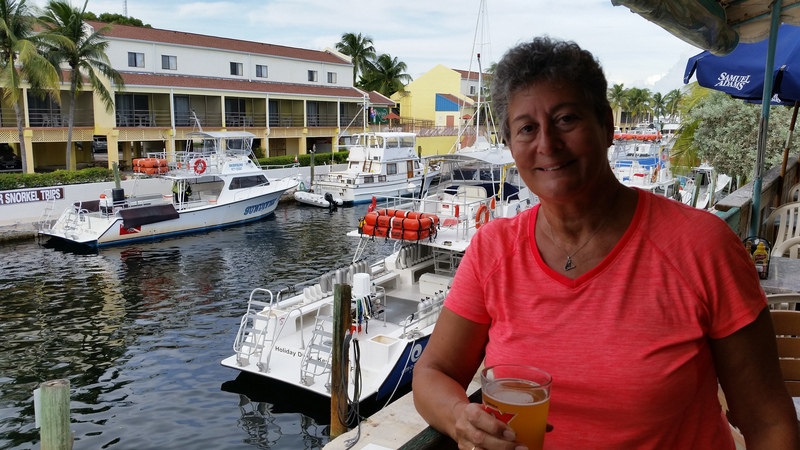 Sharkey’s Sharkbite Grill (Pub and Galley) in Key Largo was a great spot along the canal in Key Largo Harbor. As we sat on the outside deck we could watch the dive boats and afternoon cruises come and go. 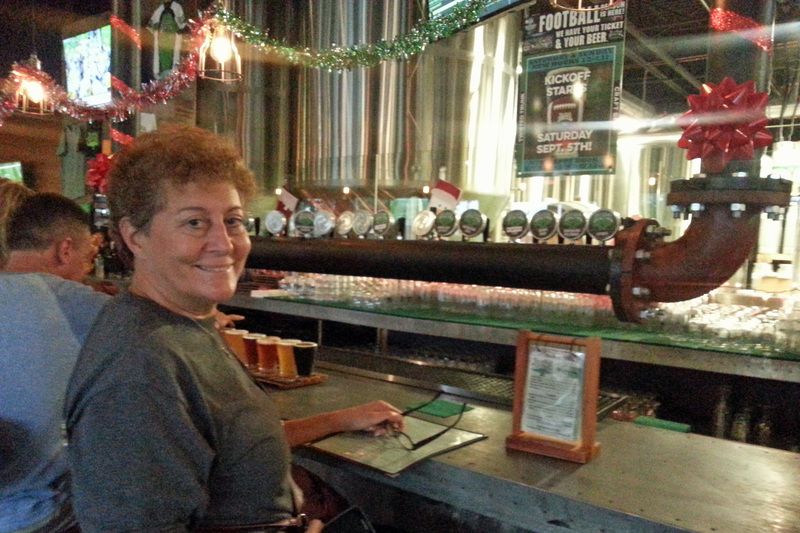 A very friendly staff helped recommend local beers and some of their specials. I enjoyed their Baja Fish Tacos (generous plate) and Jackie said the Cajun seared Ahi tuna tacos were yummie. Washed mine down with Barrel of Monks White Wizard (Witbier from Boca Raton) and Concrete Beach Tropic of Passion (Passionfruit wheat from Miami). 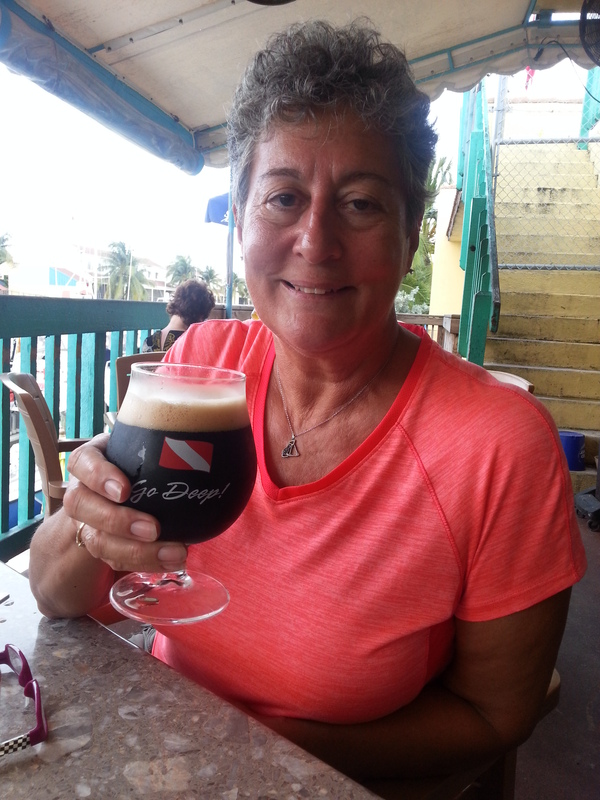 Jackie went for a glass of JDub’s Bell Cow Milk Chocolate Porter (Porter from Sarasota) after her meal (she loves porters). 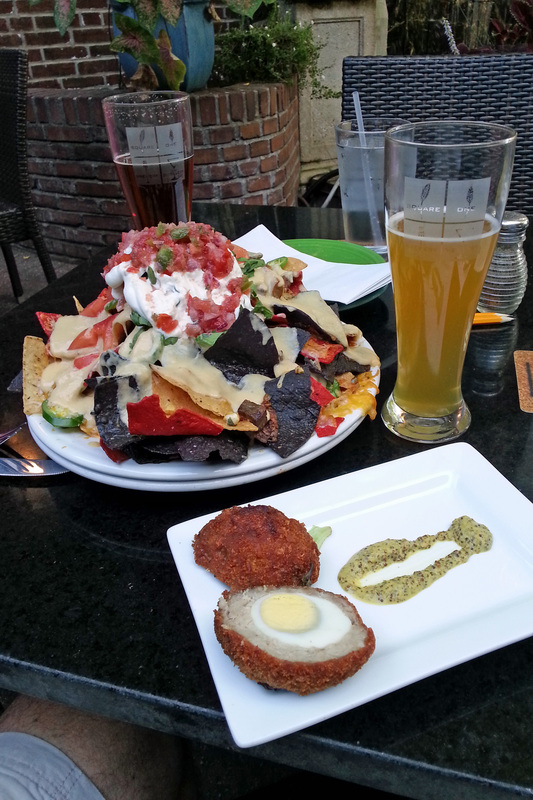 Happy Hour comes at a great time! 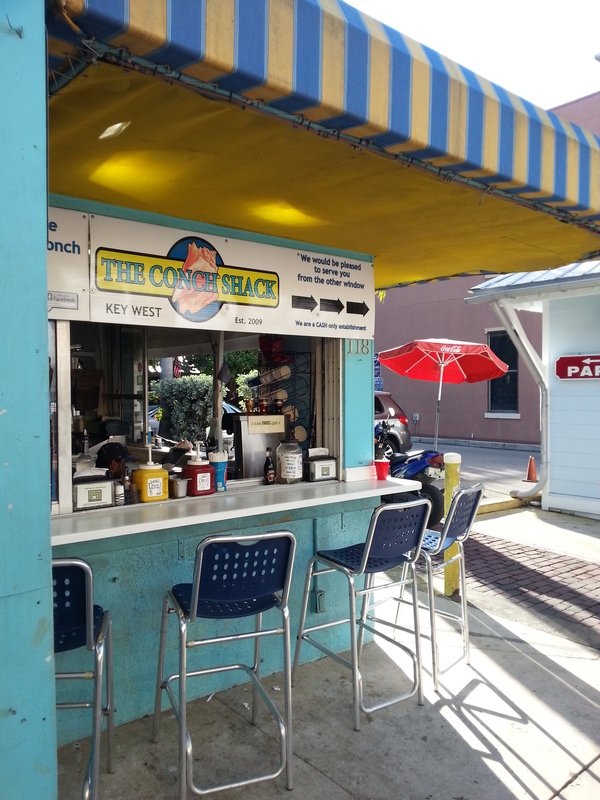 The Conch Shack, Key West was a little stand-up bar that had what I thought were the best conch fritters. 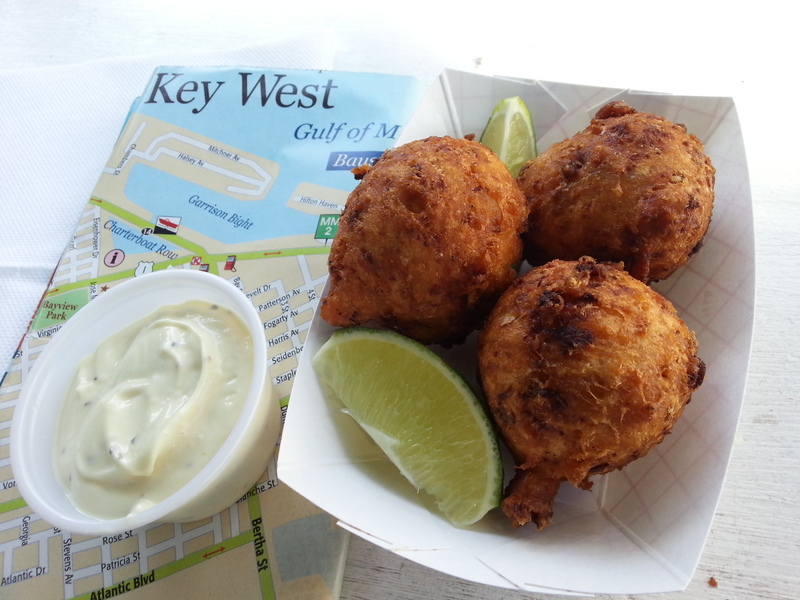 Nice Key Lime Aioli and a spicy Pink Sauce for dipping made it a perfect 2-bite fritter. I had a rooster watching me, who sadly didn’t get a crumb from my fritter! 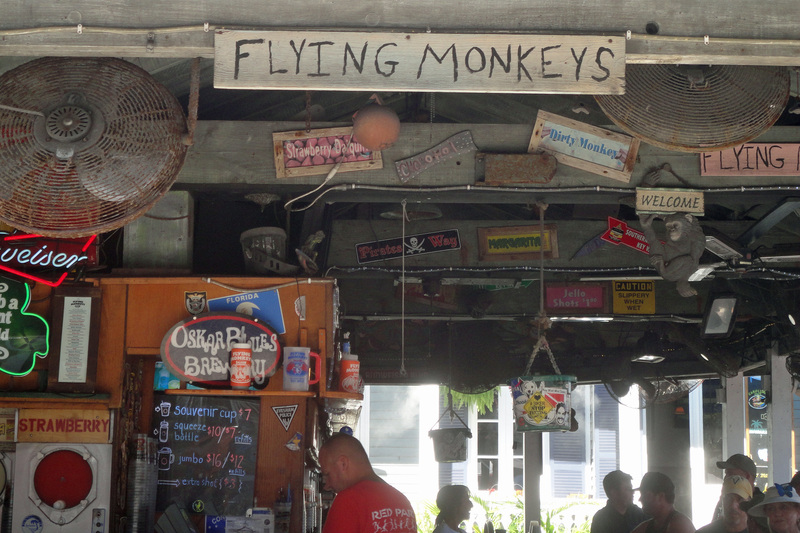 Flying Monkeys Saloon, Fogarty’s Key West had Jackie’s name all over it (don’t make me get my flying monkeys!) 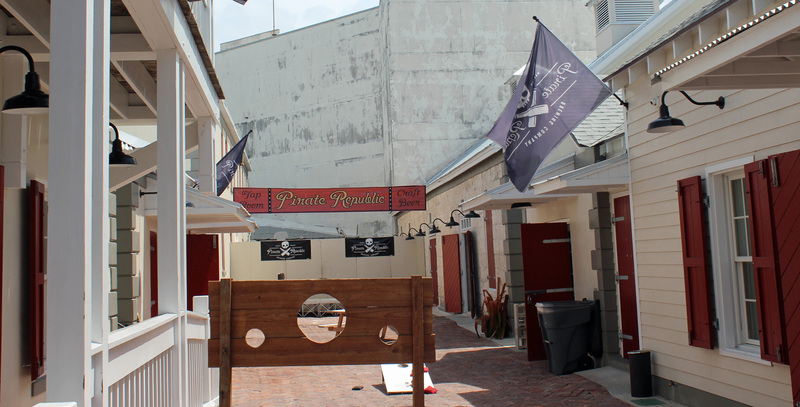 It was such a HOT day on Duval Street and bike week brought in over 10,000, so finding a cool spot that wasn’t too crowded was a challenge. This spot was really fun, though. The whole front yard of the old home is a patio and the Flying Monkeys bar features lots of frozen drinks. This was one time we skipped the beer and went for refillable containers of rum drinks. I think mine was a dirty monkey (chocolate banana, rum and liqueurs) and Jackie had a rum runner. The surprise hit was the huge Fogarty’s fish sandwich that arrived. Seriously large fillet of fish in a seasoned coating. 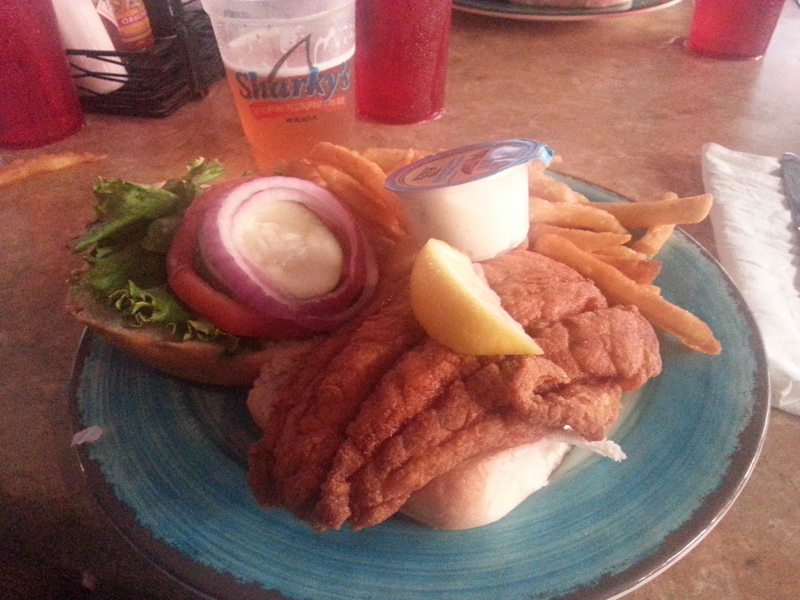 Might have pushed my all-time favorite Grouper sandwich at Sharkey’s Panama City to second place. If you go, be sure to order one and come hungry. 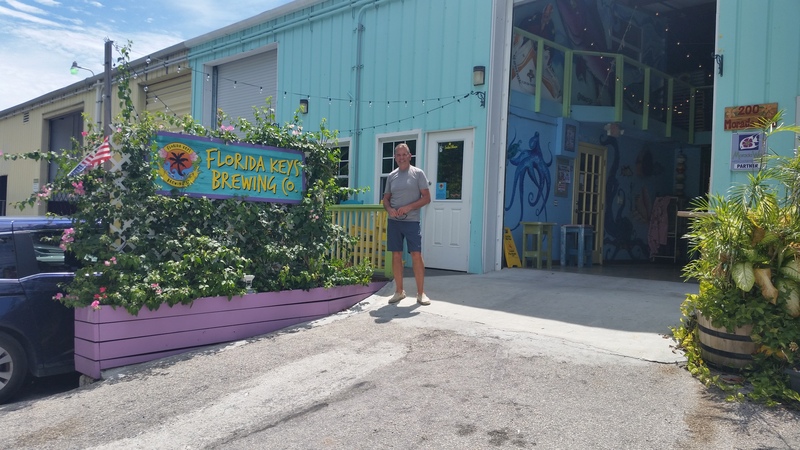 Florida Keys Brewing, in Islamorada felt like our kinda place, totally. 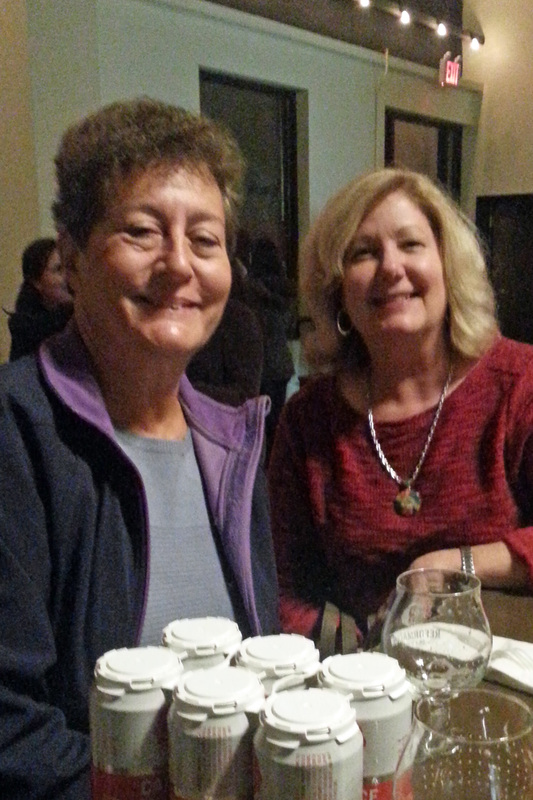 Their size and passion for beer were much like our hometown spot, Southern Sky Brewing. An explosion of color and crazy designs by local artists filled the tasting room and brewery. 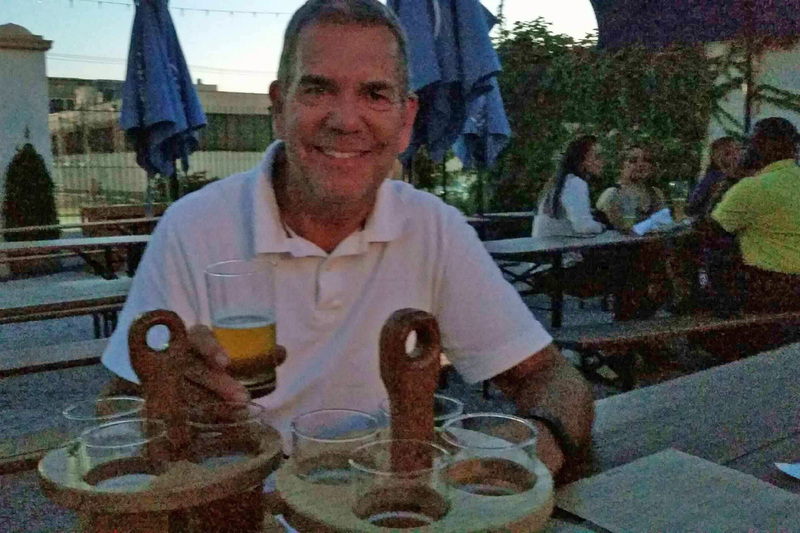 Picking 5 beers for the flight was tough – maybe we should have done the “all 10” flight instead. 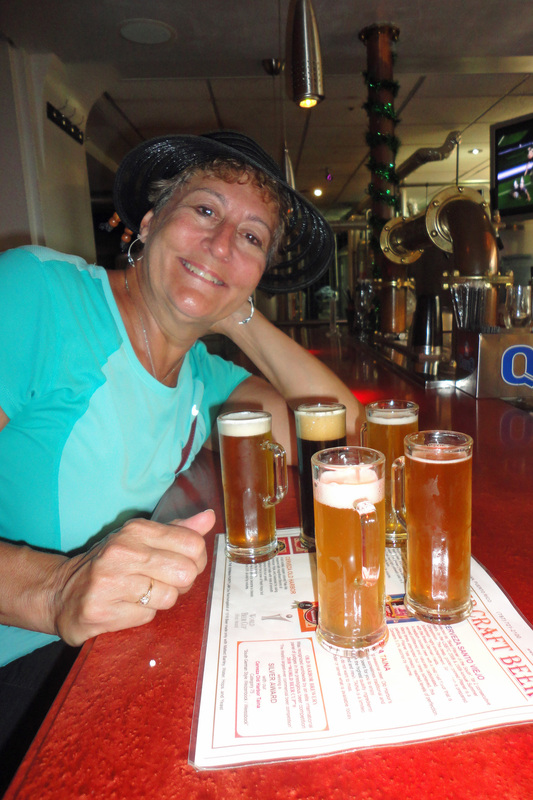 I tried Iguana Bait (with memories of the Iguana Cafe at our campsite), Queen of the South (a cream ale that Jackie liked, me not so much), Weed Line Wheat, Flakeys Key Lime Witbier and (a few extra pints of this favorite) and Hogfish Amber. Really delicious beer. Jackie especially liked Shenanigans, an Irish Red, which she talked me into, and of course she tried their Porter’s Stout. 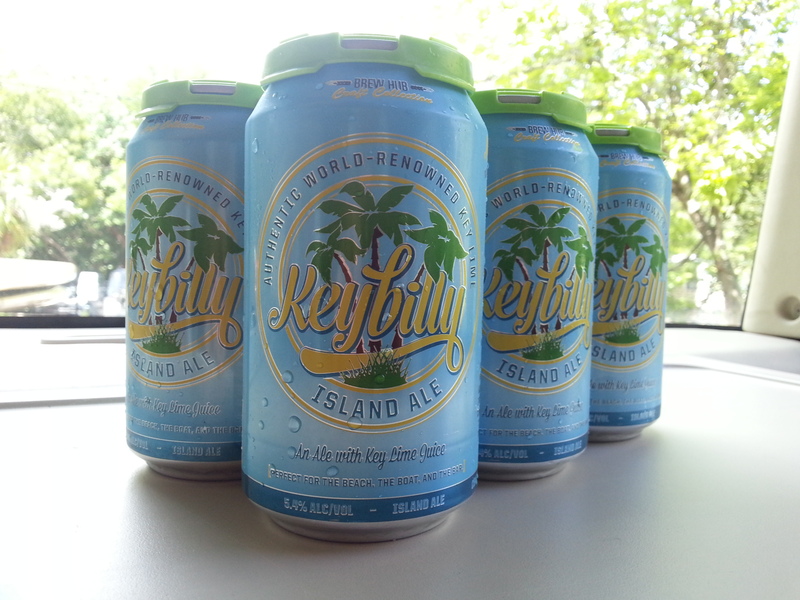 This is a definite stop if you are anywhere near Islamorada or if they start to can and distribute in the Keys. Mmm good pattie and brew at The Perfect Pint. On our quick trip to the Big Apple we really wanted to have some great food, but time was a factor and we ended up catching sandwiches and burgers at local pubs instead of a grand seating at a fine restaurant. 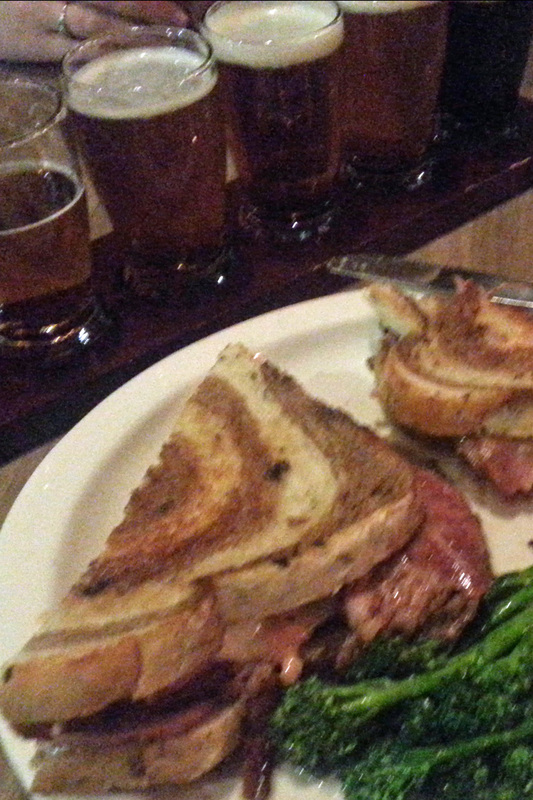 However, we were not disappointed by the hot pastrami on rye and Reuben at O’Hara’s Pub, nor the burgers and panini at The Perfect Pint. Of course it helped that they had some terrific Irish beer on tap to wash it down with. We discovered a very refreshing Irish red ale called Smithwick’s that had the creamy head of a Guiness but a surprisingly smooth finish and not as heavy. 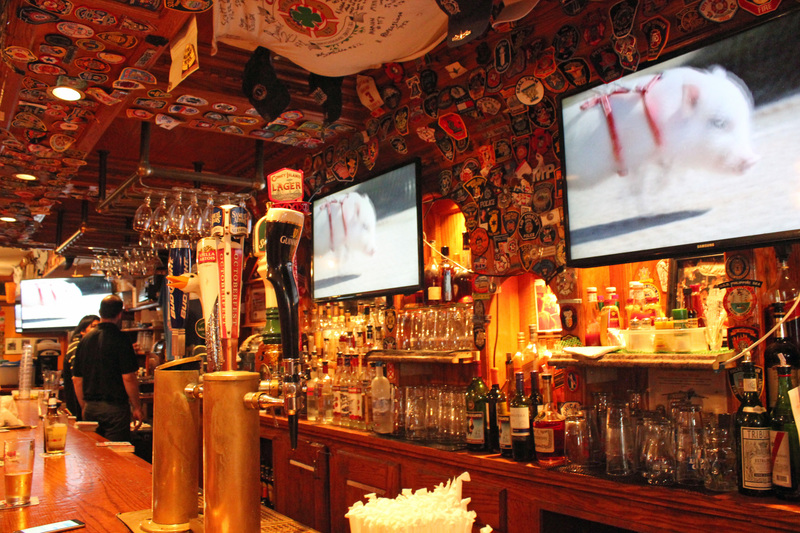 O’Hara’s sits across the block from the 9/11 Memorial and Museum and has a strong connection to the tragic events of the day, when its windows were blown in and it later served as a local spot for workers at ground zero. Now the bar is filled with over 6,000 patches and emblems from police, firefighters, military and EMS departments all around the world in tribute to those first responders. 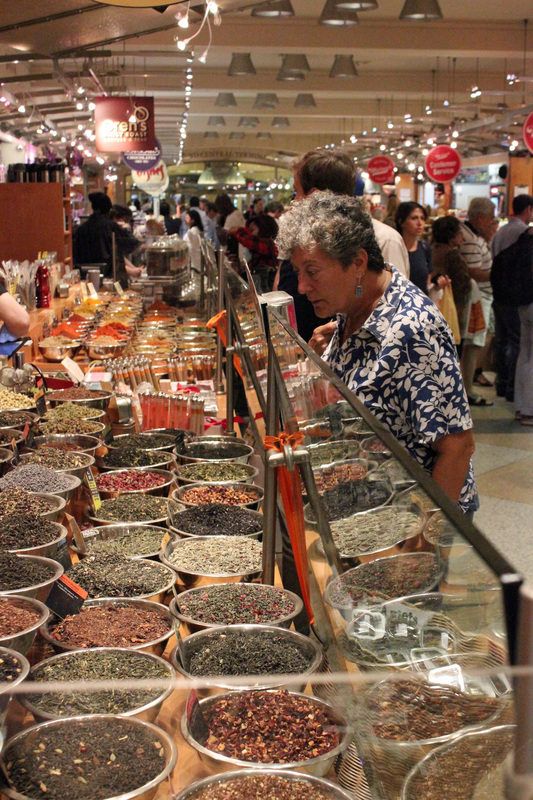 Grand Central Market was much like the food markets of Boston’s Quincy Marketplace and Baltimore’s Inner Harbor. Filled with fresh seafood, fruits and vegetables, pastries, cheeses and spices it was a necessary stop to find some bagels for breakfast and some lasagna to heat up back in our room. I had a small but delicious sweet potato stuffed chicken breast with a goat cheese and crumb coating. 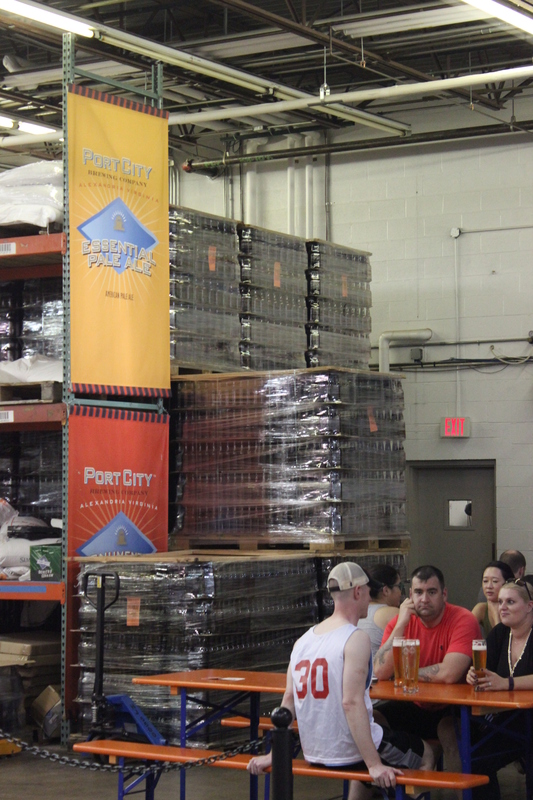 First time we tried a brew tour — this was with DC Brew Tours and took us to four very different breweries in the metro area. 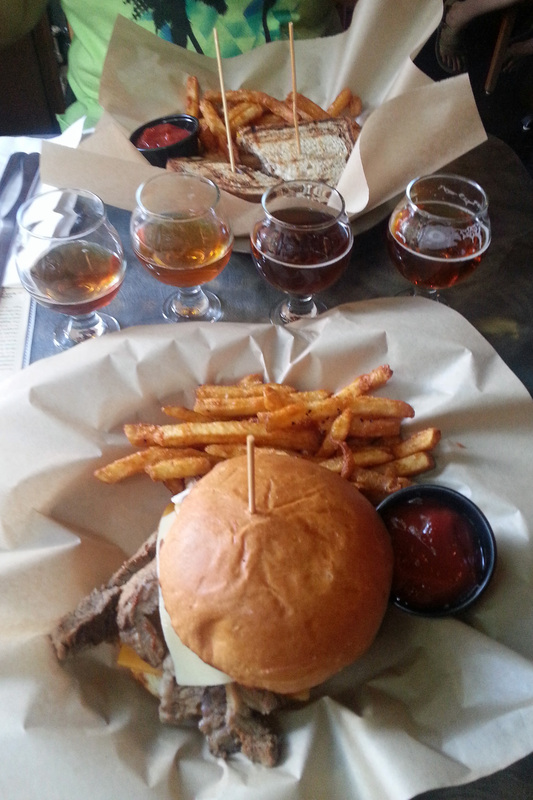 Port City Brewing, Capitol City Brewing (a gastropub), Public Option and Bardo. The outdoor street-party atmosphere of Bardo was definitely unique, but also in a sketchy part of town. If you head out, you might want to read my post “Monuments, Memorials and Memory Lane” for a short story about our experience. Beer was good at all four. 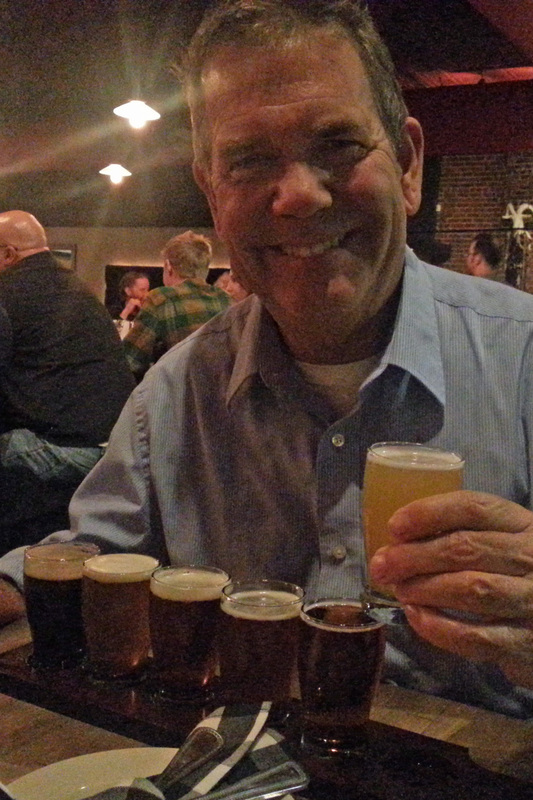 We sampled Weiss, Saison, sours, porters, wheats, red ales and IPAs that all had good character. 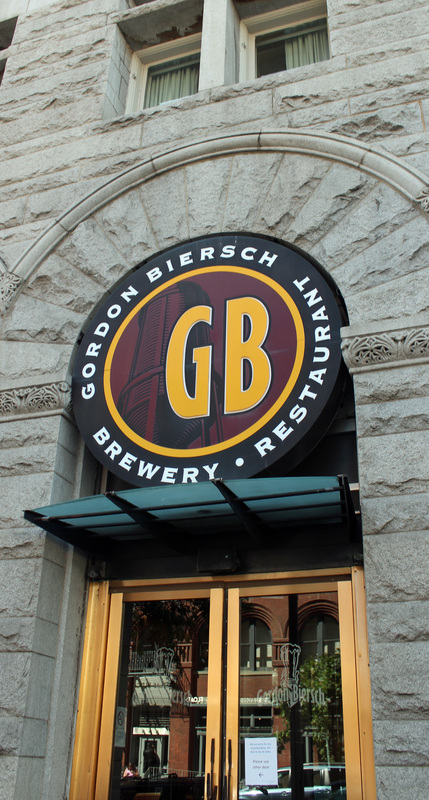 One of the particularly hot, humid days in DC found us searching for a cool spot to recharge our batteries, so we ducked into Gordon Biersch Brewery next to the International Spy Museum and located on an old bank building. 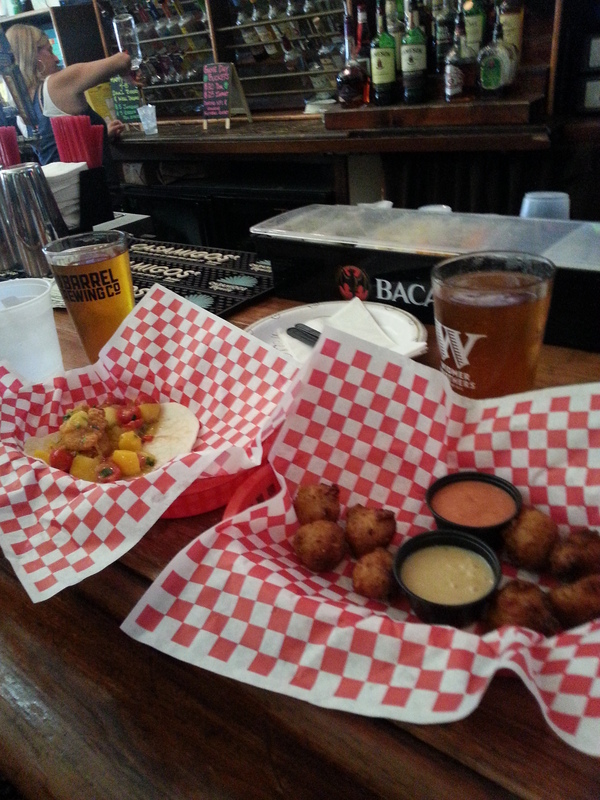 Enjoyed some good food and some of their beer. 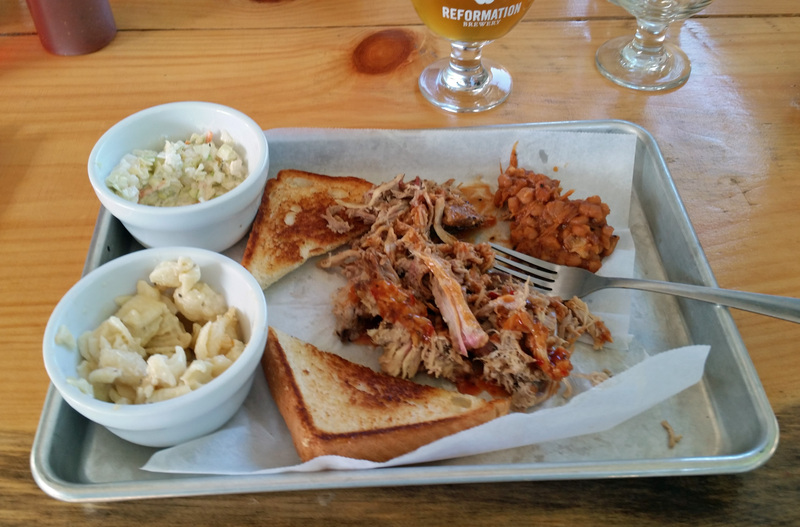 The Nest in Kennesaw isn’t a brewery, but they have a large selection of local brews on tap and generally a good barbecue. 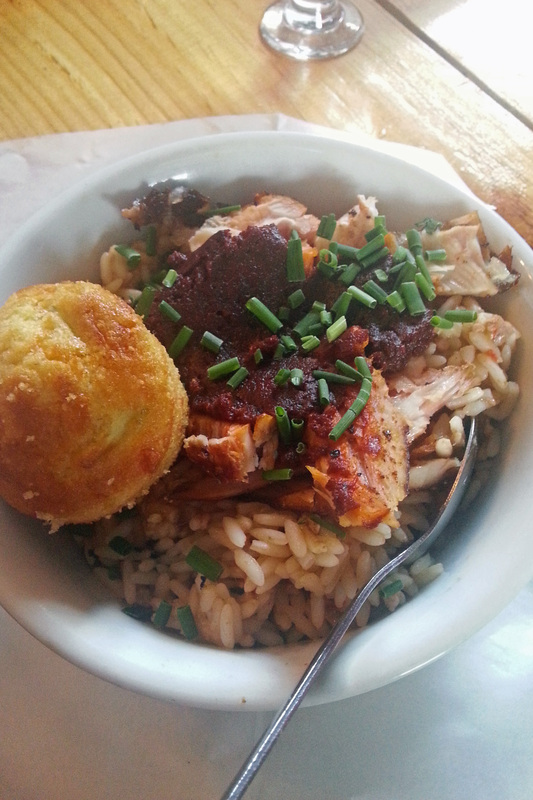 A recent visit with friends was slow on service, noisy in the dining room and the special of the day, while a cool concept, was lacking in Creole spice for my taste. 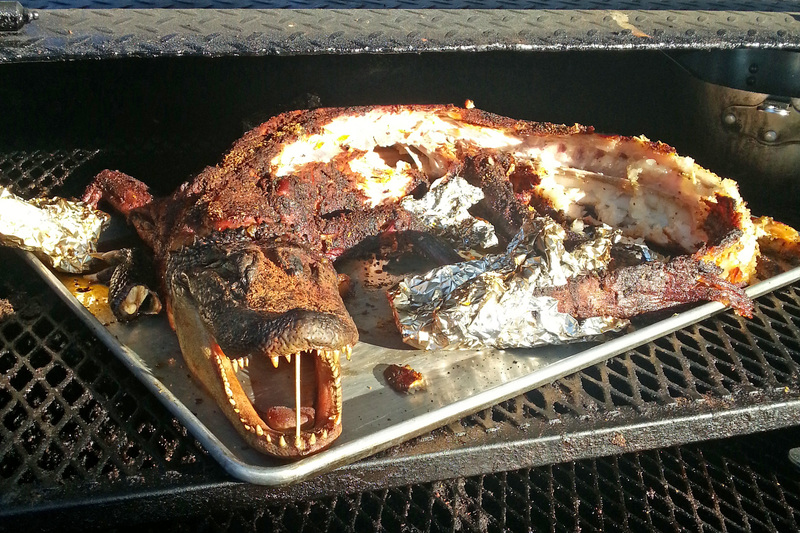 Gator Jambalaya was too mild for my palate. I love the concept, but they need some time to get their footing. Not sure I was ready to stand on the sidewalk with plate in hand to receive my Gator Jambalaya meal. Southern Sky Brewing is now canning their flagship brew “World’s Apart.” We were there at the launch party and got to see the cool pink cans (it is a pink ale, after all). It is now available in local stores, so check it out. Best of luck to Jon and the gang. 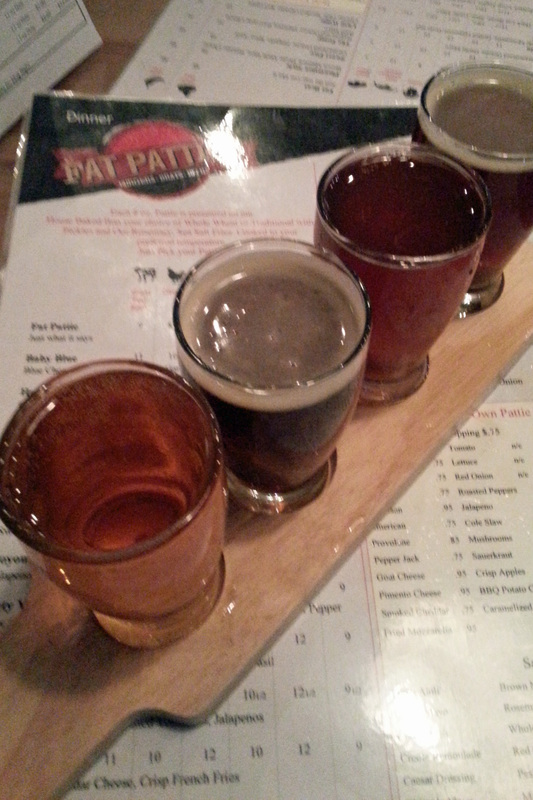 Tide’s Changin — great local shrimp pattie topped with fried oysters made for a great pairing with a flight of Salt Marsh brews at Fat Patties. 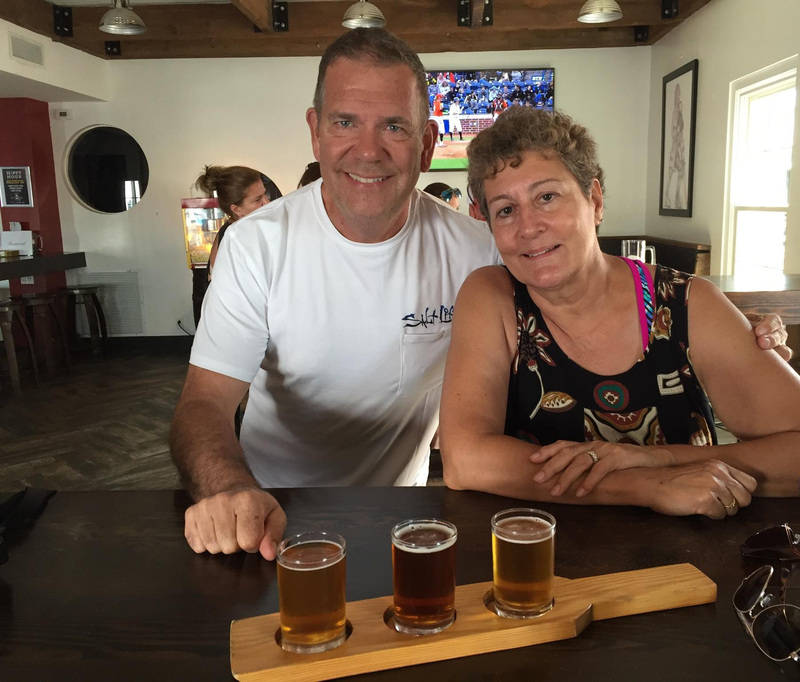 My second visit to Fat Patties and Salt Marsh Brewing in Bluffton, SC was a family affair with my Dad and brother recently. This time I paired my Salt Marsh flights with the Tide’s Changin pattie and really enjoyed it. Great spot and a lot of variety in their menu and beer selection. 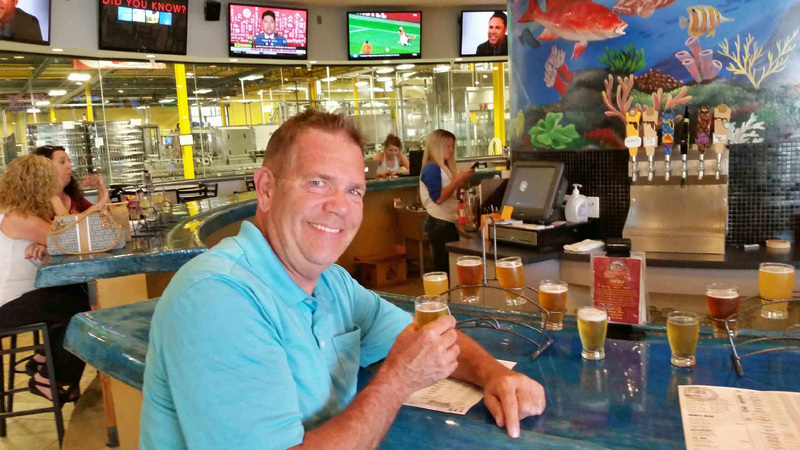 We have been checking out some of the local breweries in the Panama City Beach area while camping at the beach this summer. 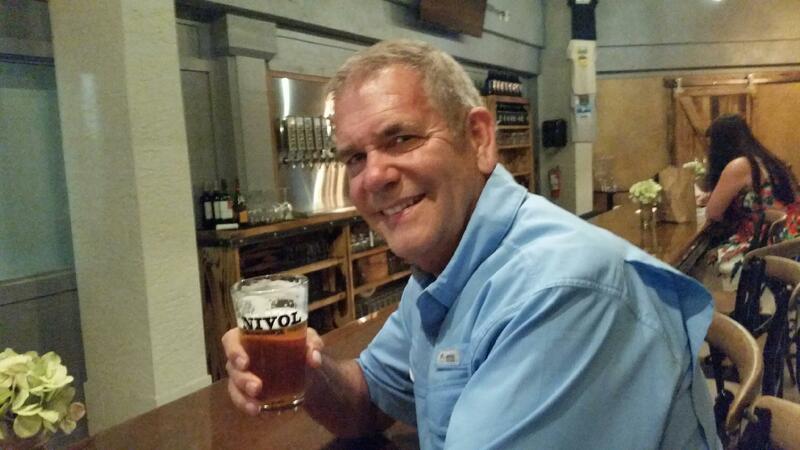 One in PCB was barely open a month and had an impressive operation: Nivol Brewing. I think they still need to mature some of their wheat beer brewing process, since I think they lacked a strong flavor profile, but it was a refreshing start. 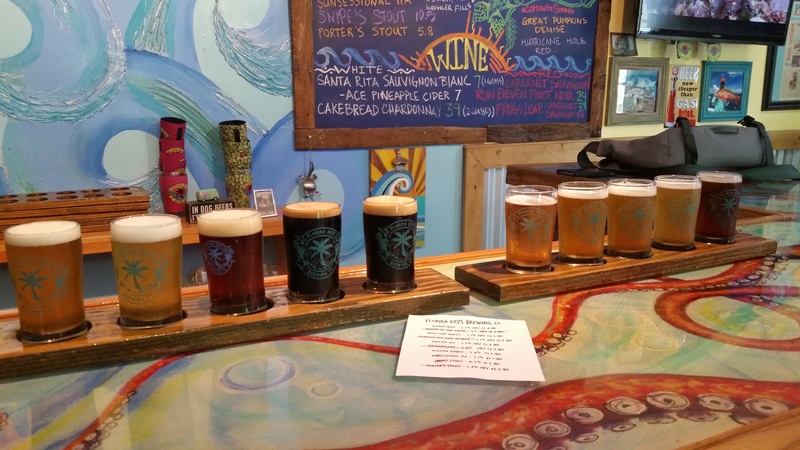 In Santa Rosa Beach, South Walton area we discovered two breweries nearly next door to each other, but with very different flavors and operations. Outside Idyll Hounds Brewing you might wonder if you came to the right place, it is so laid back. But once inside the door you are greeted by a very friendly four-footed hostess and quickly introduced to the owner/bartender. Very cool operation (and air-conditioned tasting room/brewing room) that has some really good beer. 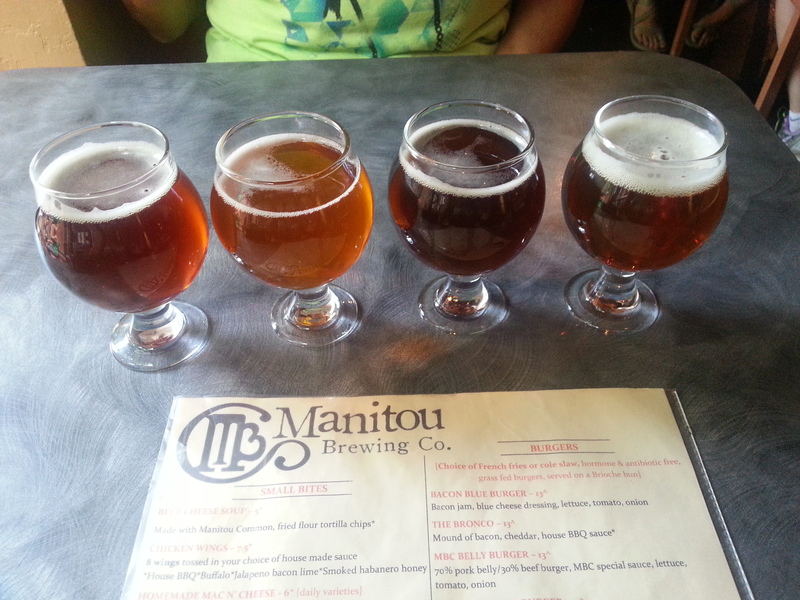 In our sampling, we tried Man O’ Wheat, a spicy and fruity wheat beer went down easy. In a series Divide & Conch’r, we sampled a Peach Tai Chili and a Papaya Habenero – both had this surprising back of the tongue heat that came out after a few swallows. Cool. We made some peeps there when we learned a couple of guys were from St. Louis and knew about Urban Chestnut and 4 Hands brewing, a couple of the first craft breweries we discovered on our trip west last fall. 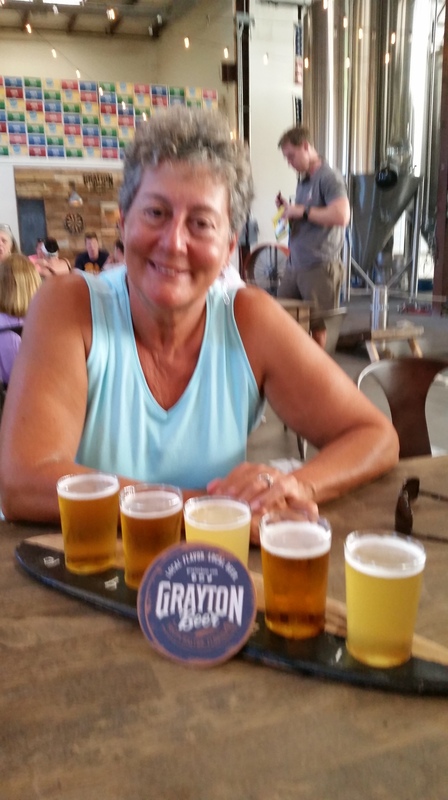 Our next stop was down the street at Grayton Beer (where our peeps caught up with us). Grayton Beer seems to be cranking out a lot of beer, with a dozen or more offerings and some large tanks for their brews. 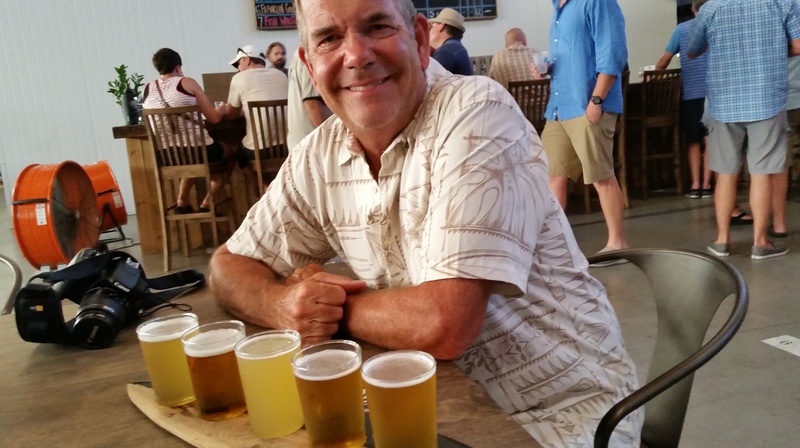 They bottle and can several, including 30A Beach Blonde (or canned Beach Permit Blonde Ale so you can be beach-friendly), a popular local favorite along beach road 30A. We sampled their Chardonnay Saison and later bought a crowler of Salt of the Gulf Gose from Craft Bar. Very nice, refreshing, slightly tart beach beer (IBU 12, so you know it is smooth). Anyway, the tasting room is a large bar right in the brewing room, with fans blowing and a guitarist playing (it was a hot night). 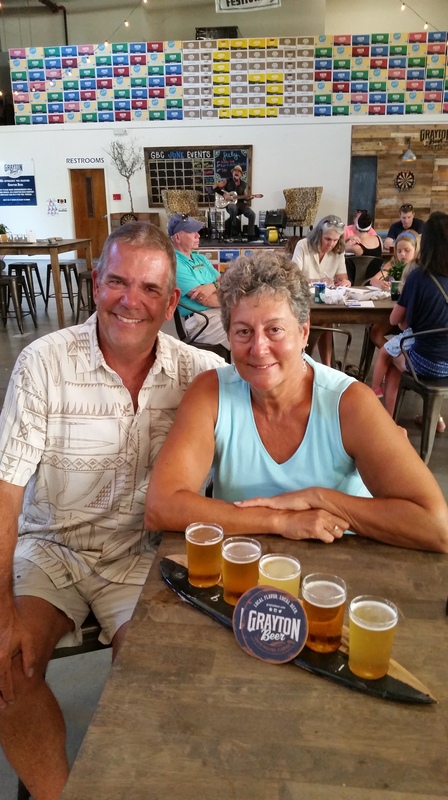 We learned that one of our peeps ran a local pub crawl pedal bike business (Emerald Coast Pedal Tours) and they were all planning to bar hop along Grayton Beach on the weekend. Although we were invited to join in, we later opted out (not sure how late the pedal tour was going to go). 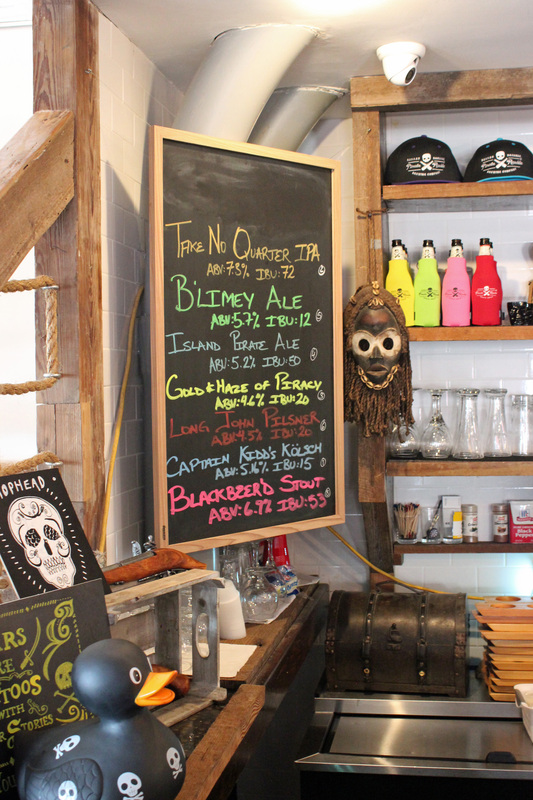 Later in the week we stopped by The Craft Bar to get some Crowlers (32oz. cans) to take back to camp and tried yet another good pilsner: 5 Rabbit Gringolandia Super Pils (because it is 7.2% ABV I guess). 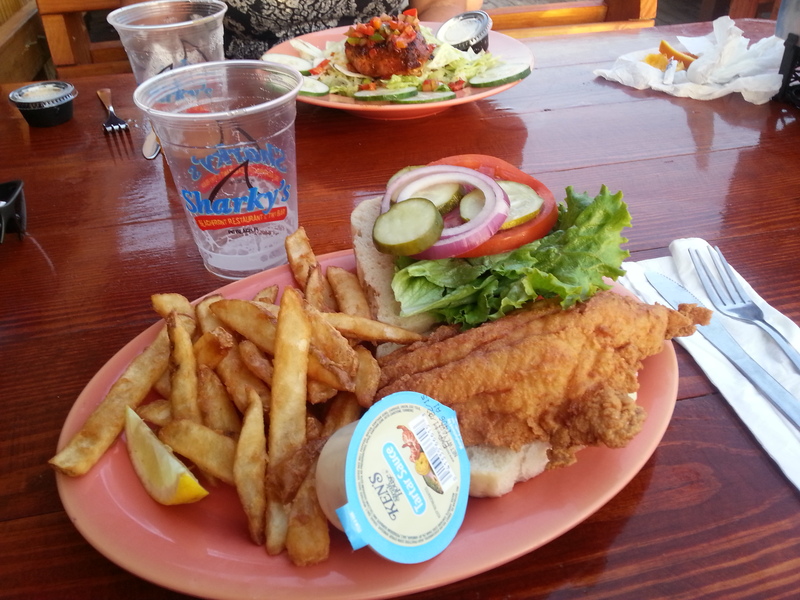 By the way, we stopped in at Sharky’s in Panama City Beach to see if the grouper sandwich was still the best, and YES! it remains my favorite. 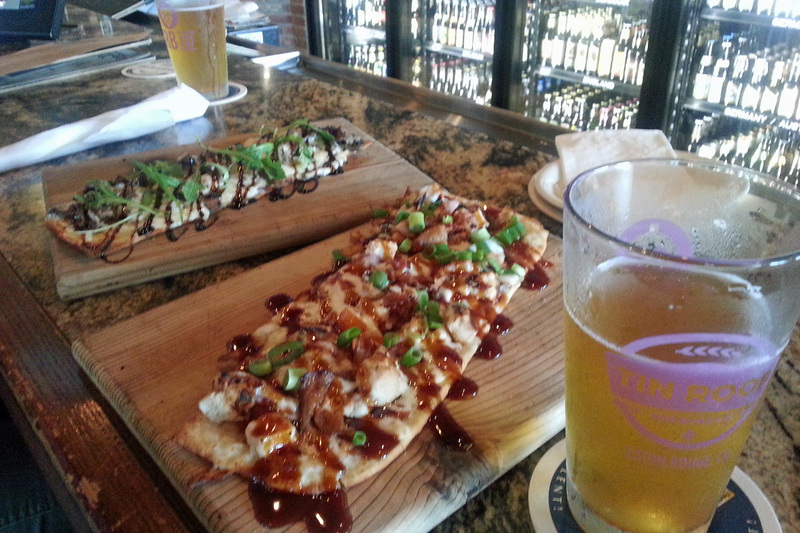 Love the sticky, saucy Black and Blue or Chipolte Chicken flatbreads along with a good craft beer at World of Beer. 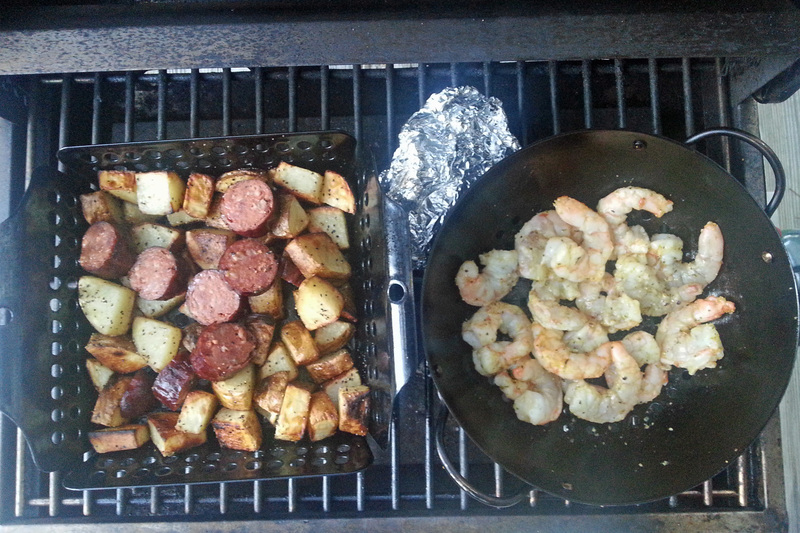 Most of the time in camp we try to grill our meals. Keeps the heat out of the van. Although my favorite grilling method is with charcoal in my Weber grill, the small suitcase propane grill I use works out darn good. Two small baskets help with the potatoes and veggies. We usually will roast sweet or white potatoes along with either brussel sprouts, yellow or zucchini squash, broccoli or cauliflower as a vegetable. Always comes out great. 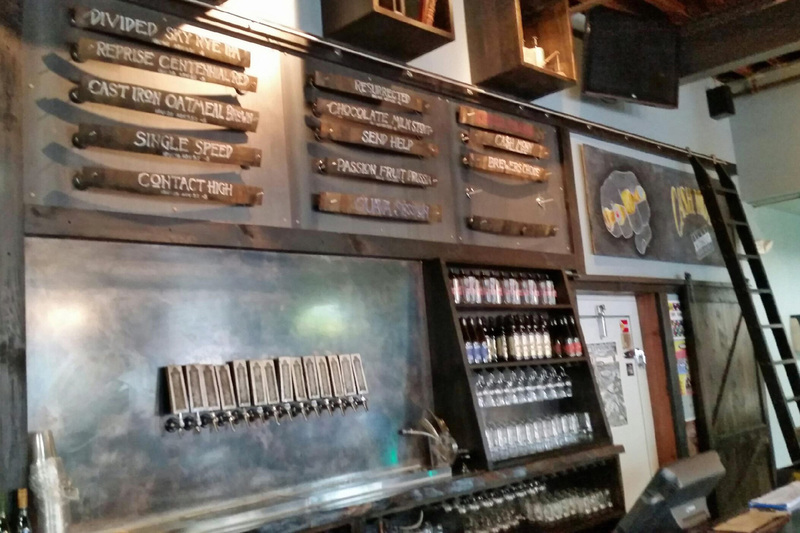 The Nest isn’t a brewery, but they have tons of craft brews on tap. 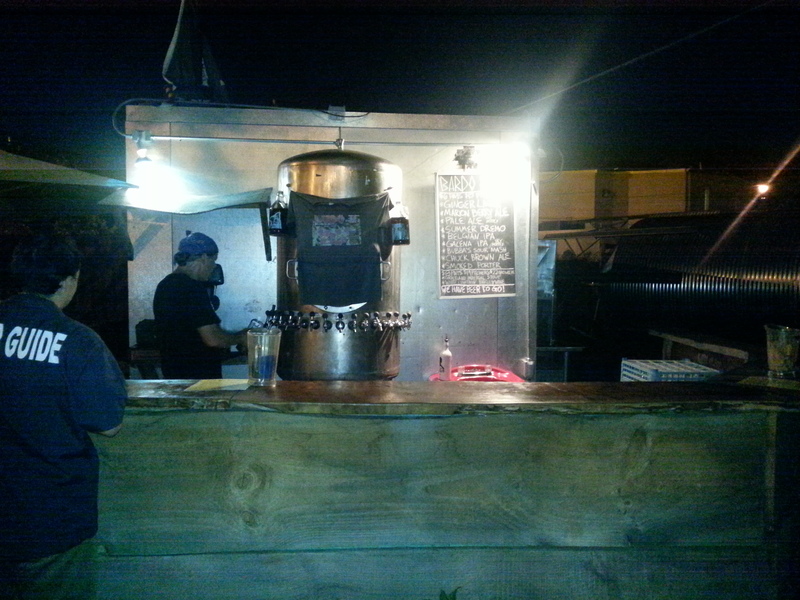 The new spot on Cherokee Street in Kennesaw has wood smokers out front that crank out all sorts of smoked meats. 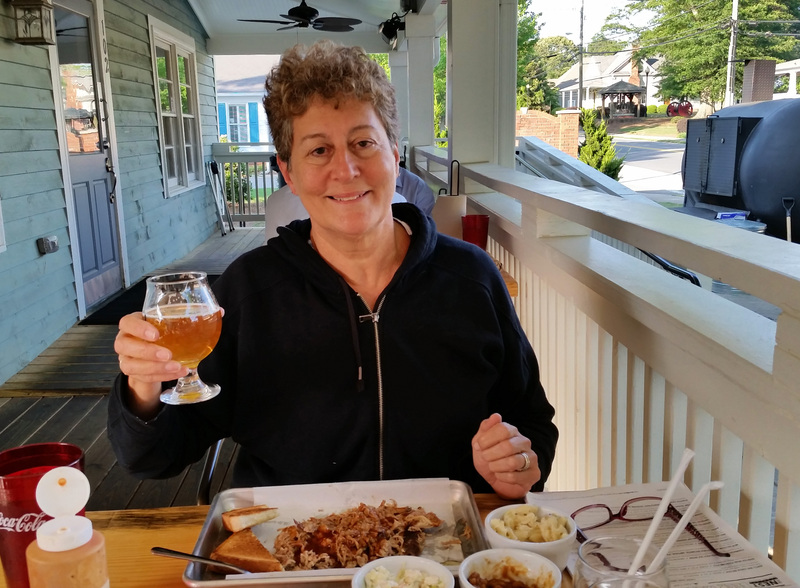 We sat on the front porch and had a plate of pulled pork with slaw, mac and cheese and baked beans, washed down with some beer of course. Tasty plate of pulled pork with three sauce choices. 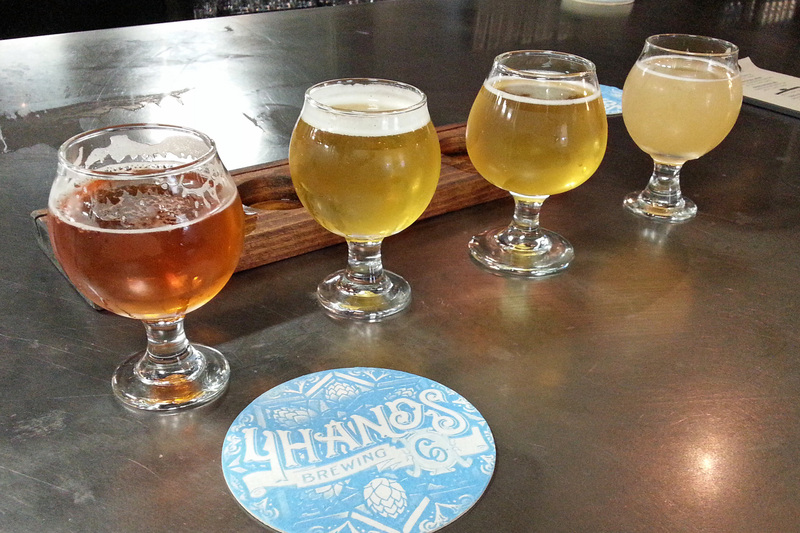 Nice that you can choose 4, 8 or 16oz glasses to sample a few choices. 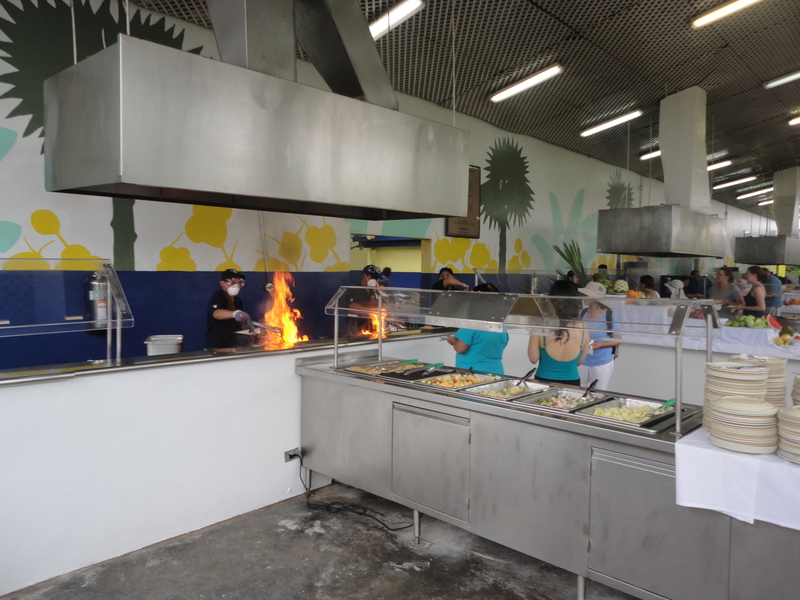 We rate it definitely worth a visit, since the food tastes great and the prices are quite reasonable. And peeps Monroe and Heddy! 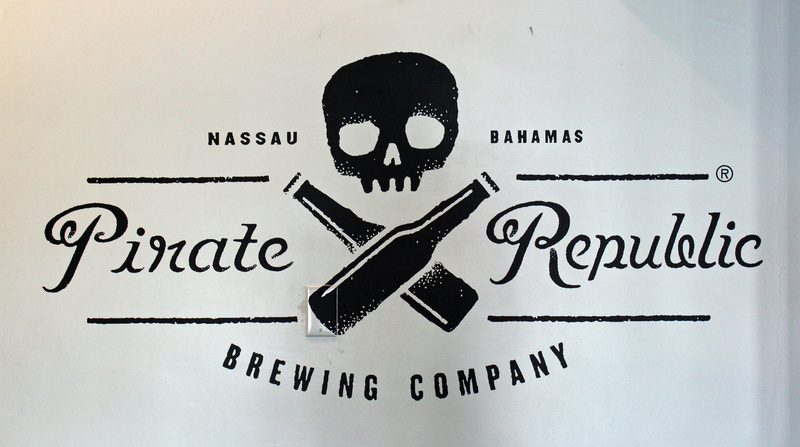 Quite a ways to go for a flight of beer, but we found Pirate Republic Brewing Company in Nassau on our recent cruise. 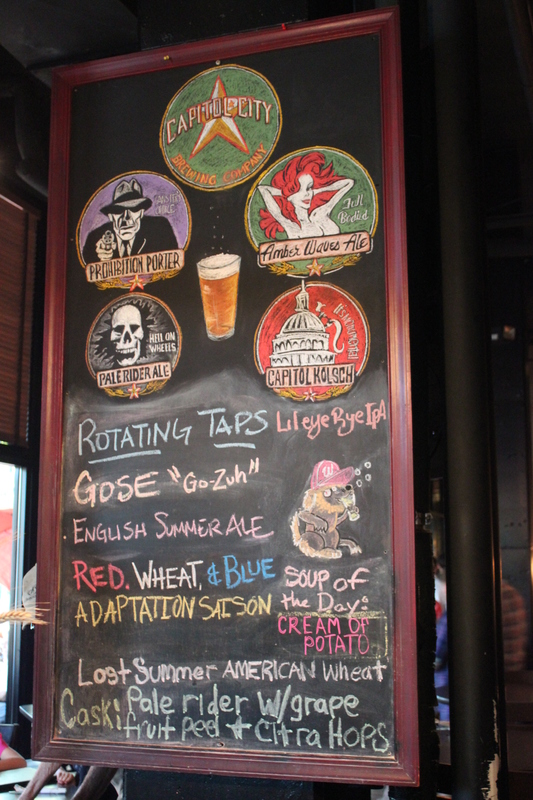 We liked the Long John’s Pilsner and Captain Kidd’s Kolsch. Island Pirate Ale was more bitter than I like (well it did have an IBU of 50). Nice vibe, but a quiet day at the brewery (Senior Frogs seemed to be the place to be). 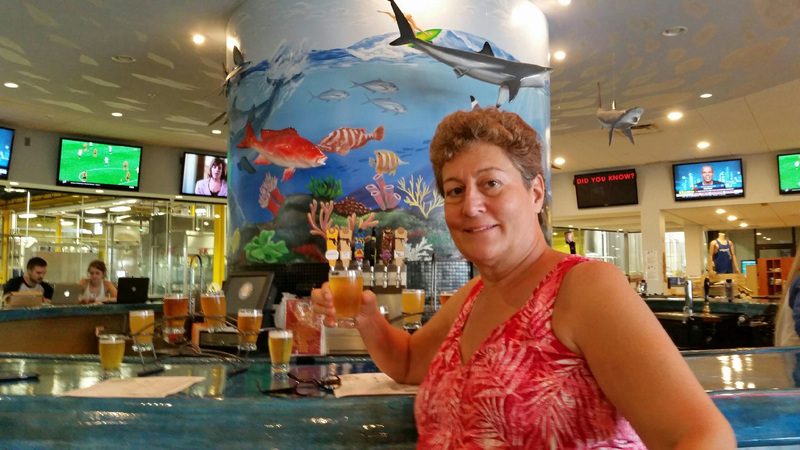 Just before our cruise to Nassau, we found Florida Beer Company in Cape Canaveral and enjoyed a flight of course. Wraparound bar with a view of the brewery had a colorful look and feel. 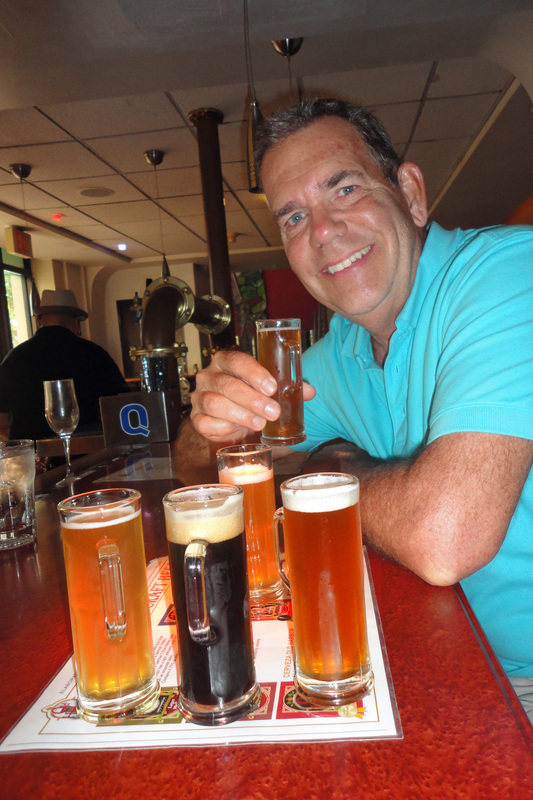 In our flights of six, the ones that stood out for us were Feast of Flowers, Key West Southernmost Wheat, Surplus Honey Citrus Ale, Hurricane Reef Caribbean Pilsner, Key West Sunset Ale and Gaspar’s Porter. A local favorite is Swamp Ape Dipa, a double IPA at 10% ABV, which we passed on. They also have some delicious hard ciders: Key Lime and Blood Orange were yummy. First Growler at Southern Sky! 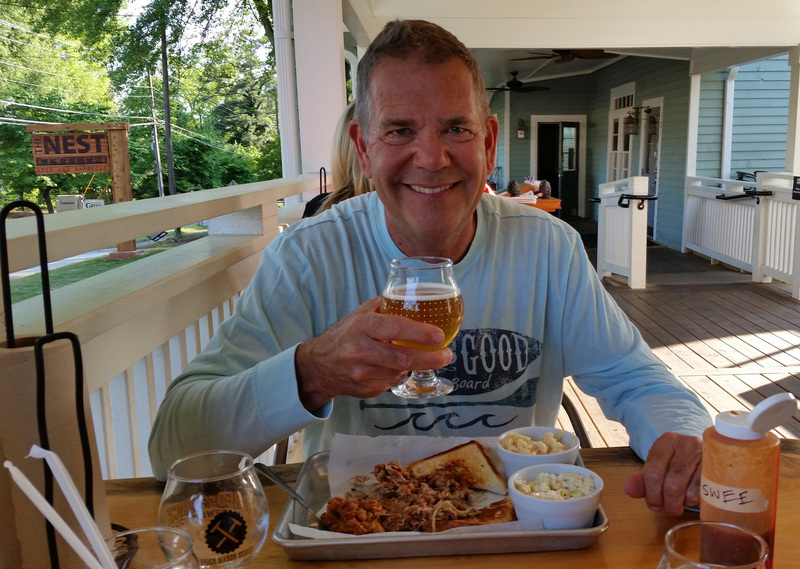 We continue to enjoy our favorite local brewery, Southern Sky Brewing, and were quite surprised when we stopped in after getting home from our camping trip to Cloudland Canyon State Park (hey, it was a rough 2 hour ride back home, what can I say?). 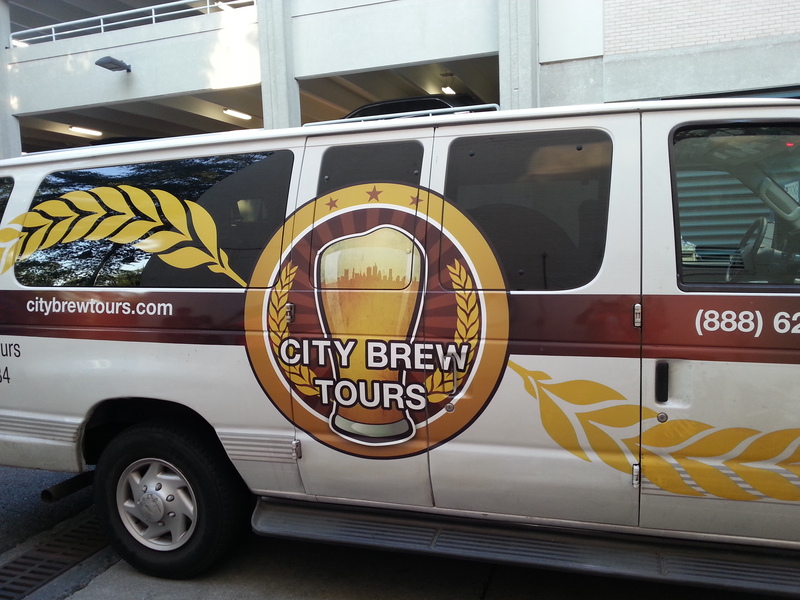 We knew the rules for breweries had finally changed for the better and now we could purchase an upgraded tour that came with a growler to take home — ok, that didn’t take much convincing. 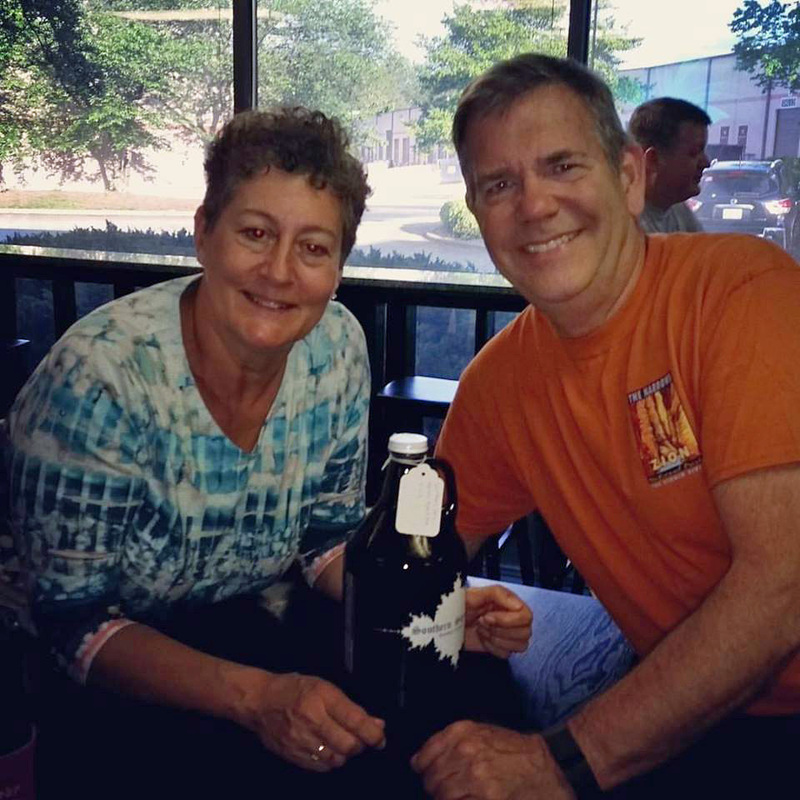 But what we didn’t know was that we purchased their first growler! Oh the fame and fortune! Now we are featured on their facebook page … and that’s an ok thing, now that we have retired from teaching and can have a real life. So check out our brew peeps at Southern Sky Brewing (their facebook page is best) and be sure to stop in to sample their beer. They have plans for a Cinco de Mayo party and May (the) 4th (be with you) special Millenium Falconer brew. Ok, I couldn’t help myself and asked John why they passed on “Southern Skywalker” as the special brew? … he took a few notes for next time. 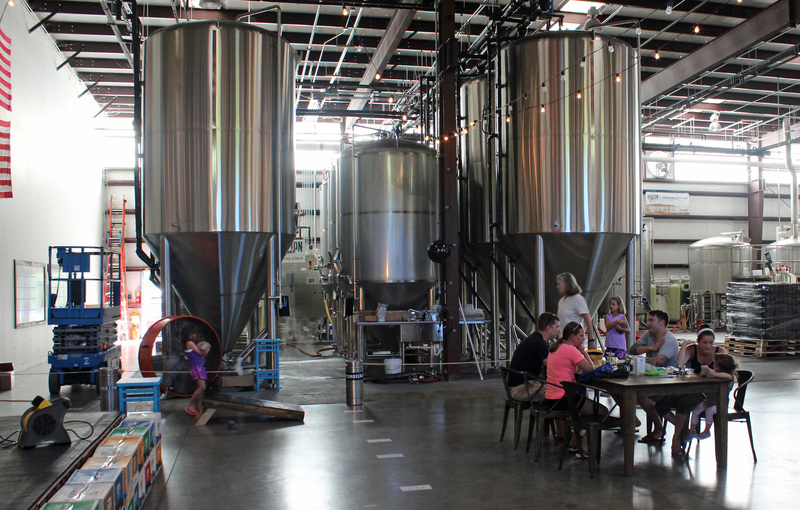 A new local favorite on the scene here in Kennesaw is Southern Sky Brewing. 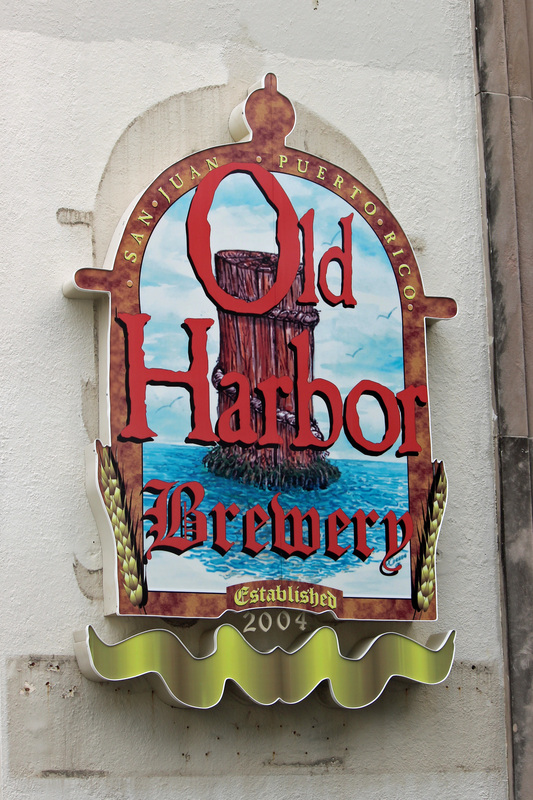 We visited for their tours on the third week they were open and liked every one of their brews. Contingency Plan B, World’s Apart Ale and Beholden IPA are favorites. Had fun at their first St. Patrick’s Day celebration and tried Irish Car Bomb Stout — best of luck to Jon, Jay and Melissa! Check them out! 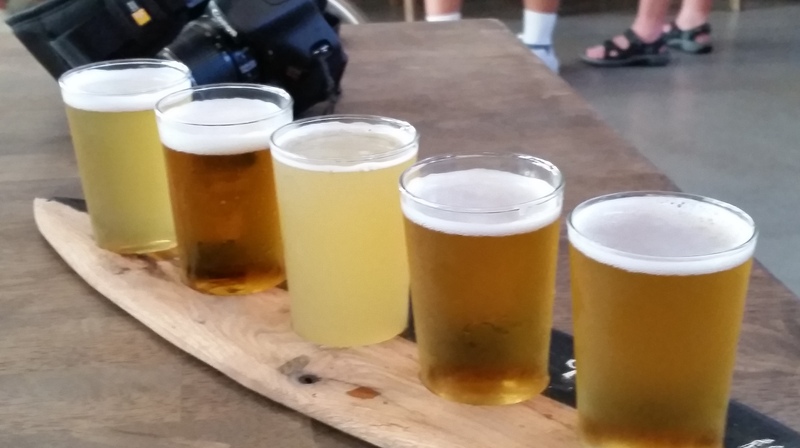 Continuing our mission to visit local craft breweries, we met up with friends in Woodstock in December to check out Reformation Brewery and loved it. Great vibe and some beers that suit our tastes. 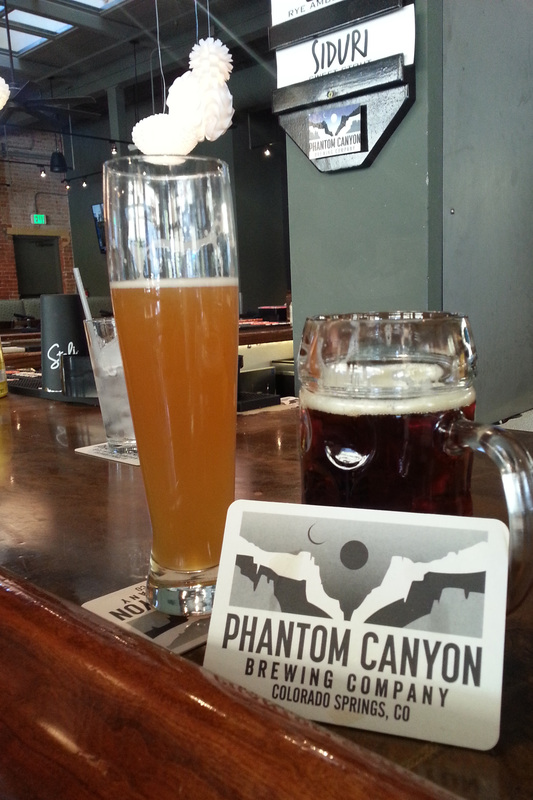 Our favorite is Cadence, a Belgian-style Ale, but Union was a refreshing one with notes of citrus and coriander. 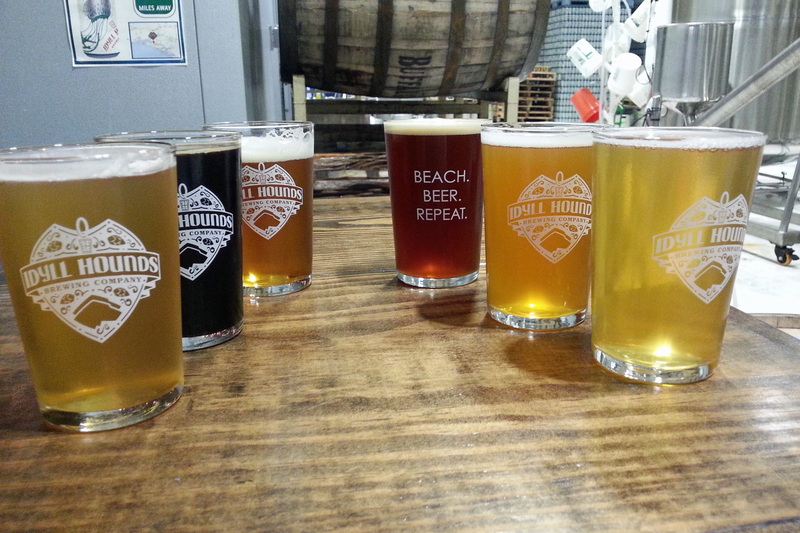 Checked out Red Hare Brewing in Marietta and took a tour with samplings. 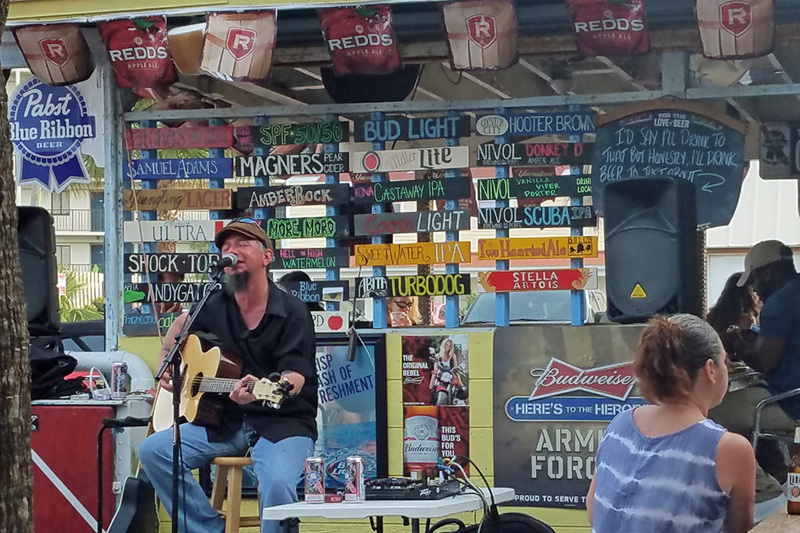 Again, a nice vibe, some live music and several samplings that we liked. Watership Brown is one they are known for and we also liked Long Day Lager. Sticky Stout, an oatmeal stout, was their seasonal, but I don’t care as much for stouts and porters beyond a sampling. Bring some pretzels or munchies. 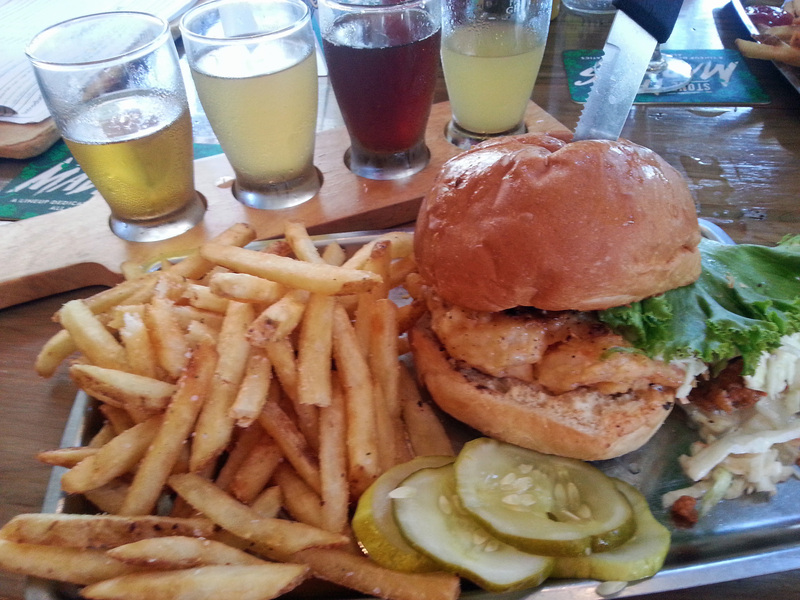 A visit to Fat Patties and the Salt Marsh Brewery in Old Town Bluffton featured just that, a FAT PATTIE for your burger. Baby Blue was my choice and if I recall, I had a wheat beer, Red Hare Watership Brown, a red ale and a Belgian Dubbel. The twist on burgers is you can order beef, turkey, shrimp, chicken or black bean as the pattie. If you are down that way, I recommend it. They are just starting up their Salt Marsh Brewery upstairs, so local brews are on tap along with regionals. Unlike Georgia, they can sell directly to consumers. Great local brews and awesome sandwiches at Beast and Barrel Gastro Smokehouse in North Shore (other side of the river), Chattanooga. The Big Katz, a pastrami sandwich with thick slices of meat, marinated, smoked and grilled, topped with house-made kraut on Neidlov’s marble rye is hands down the best pastrami sandwich I have ever had. 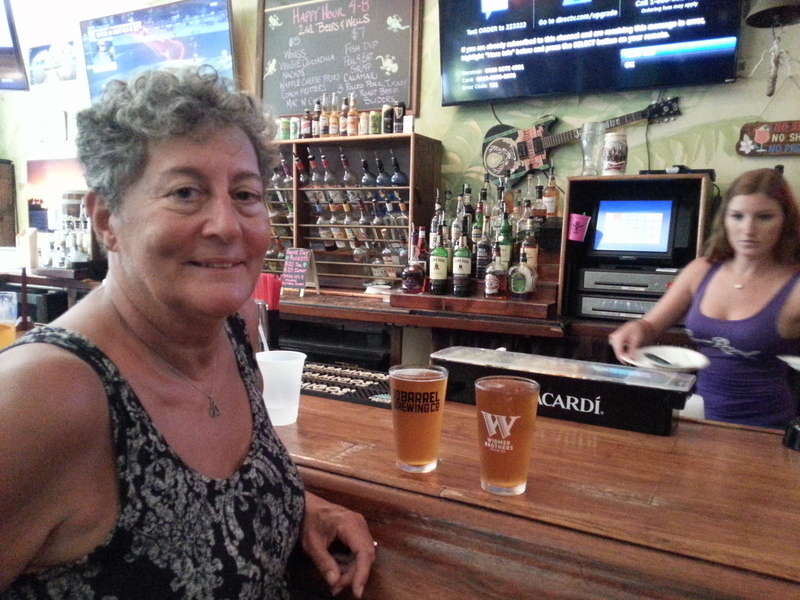 Ready for a flight at Twisted Trunk – a hopping spot in West Palm Beach. 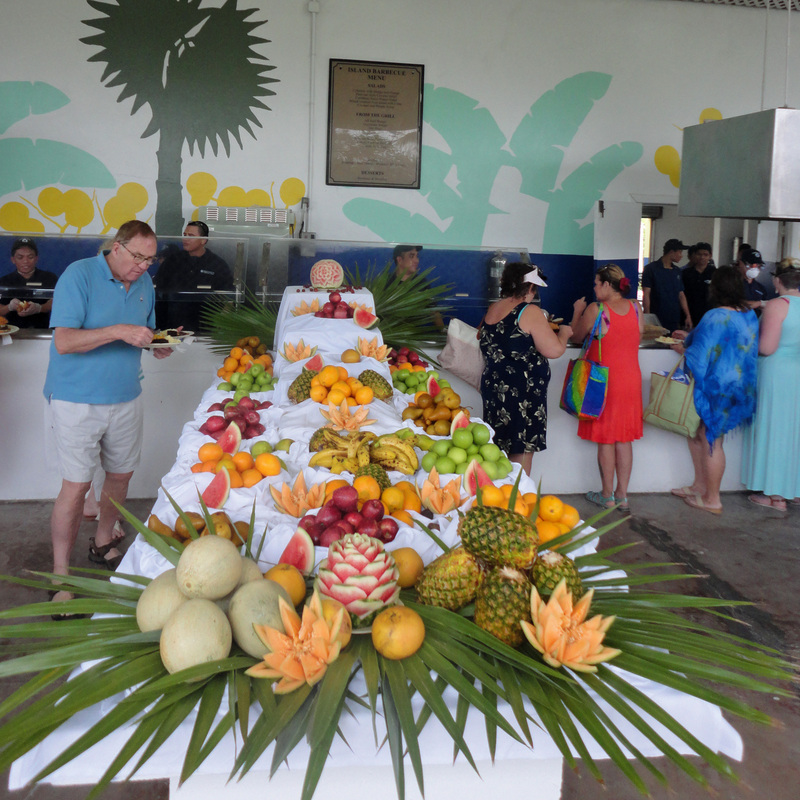 It’s not really fair to say you should try the Caribbean Barbecue spread on Half Moon Cay, because you would have to be on one of the Holland America cruises first. But this relaxed day at the gorgeous beach featured plenty of grilled Mahi Mahi, chicken, beef ribs, burgers and tasty side salads to fill your tummy. Hey, the food we fixed in camp was great, too. 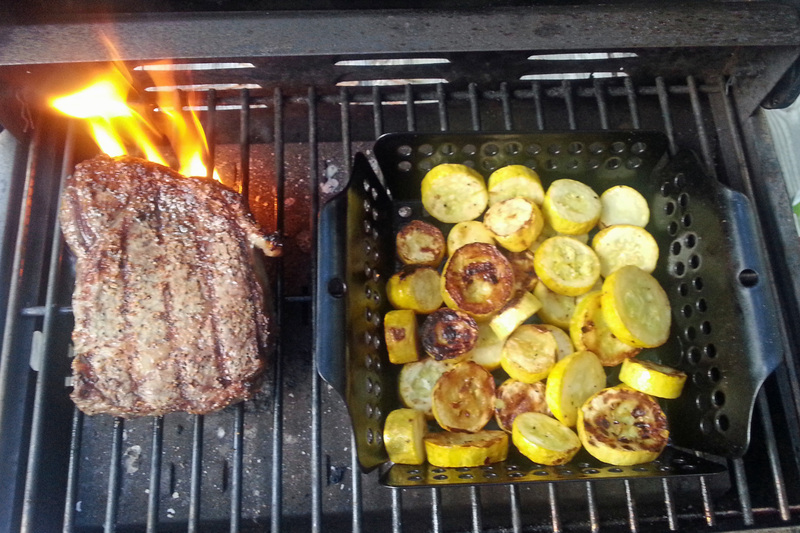 Generally a steak or two on the grill with roasted veggies or potatoes. 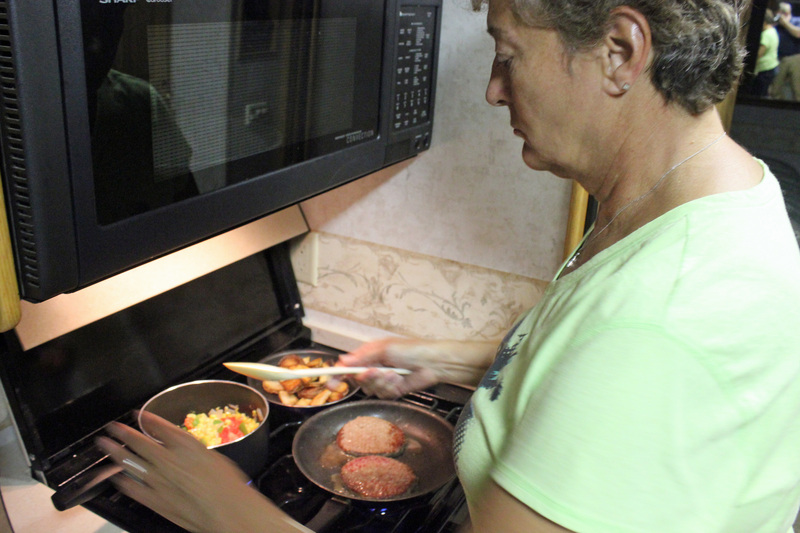 Even on rainy nights (with no working microwave) Jackie could whip up a great meal. Of course there were the “must see” spots in the French Quarter, but we didn’t find the vibe to be as warm and welcoming as expected. 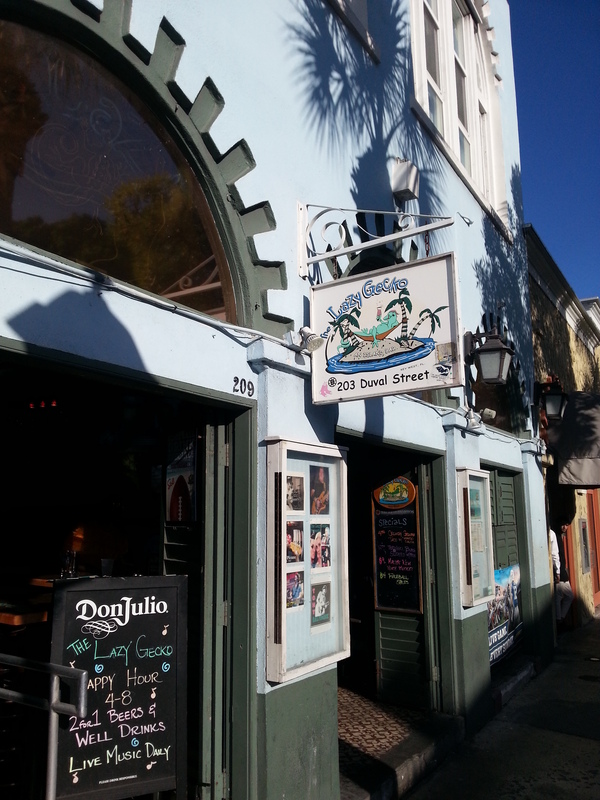 A little too tourist-oriented and a bit pricey, except the drinks-to-go along Bourbon Street. 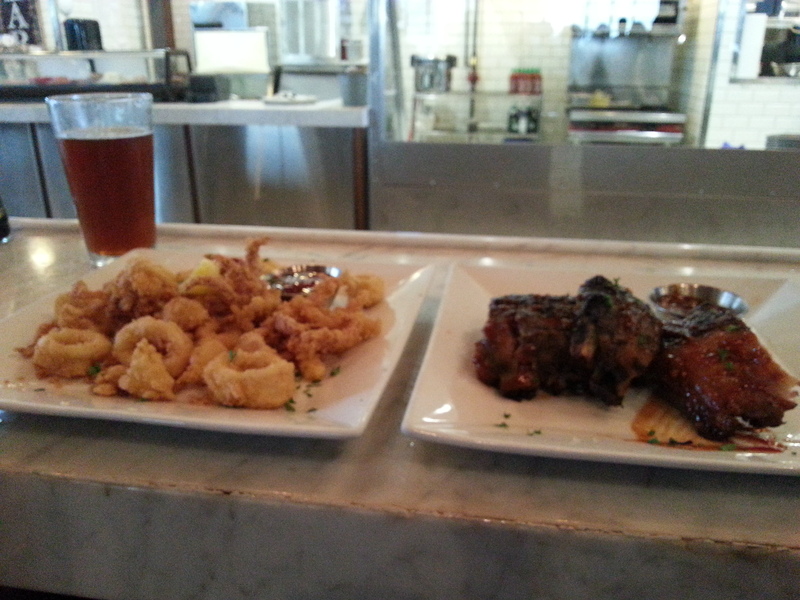 Did enjoy the brewpub. 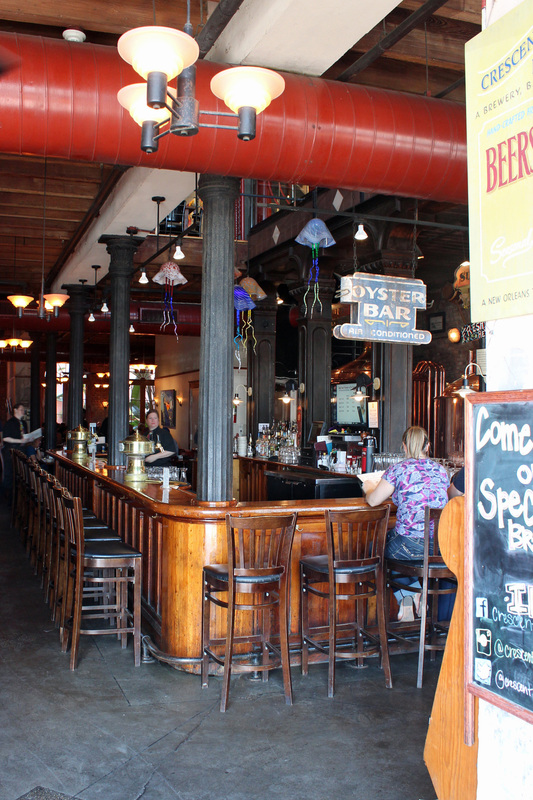 Crescent City Brewpub was fun and relaxed. 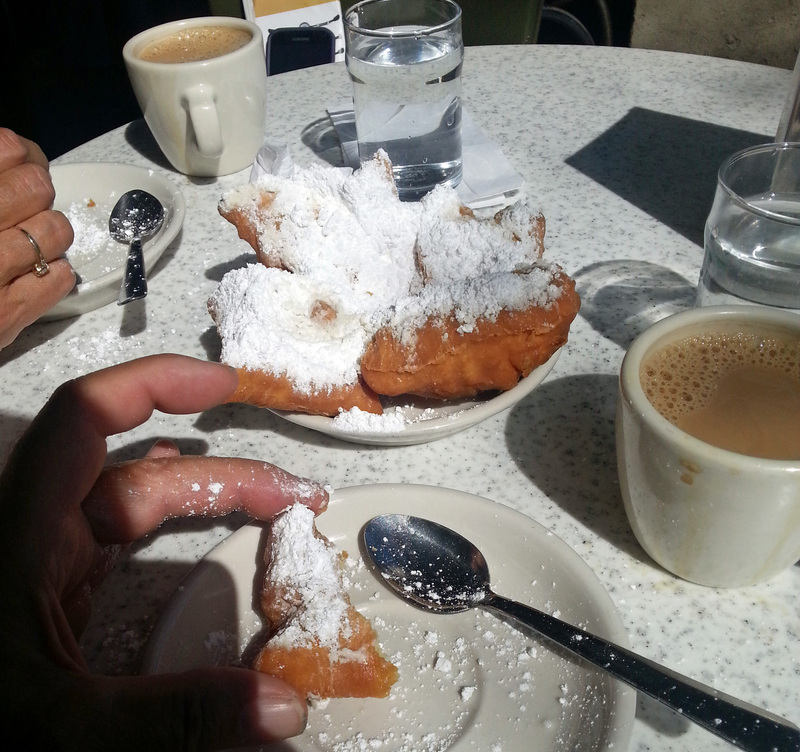 At least a cup of powdered sugar over a stack of beignets and Cafe au Lait at Cave du Monde. Very good. 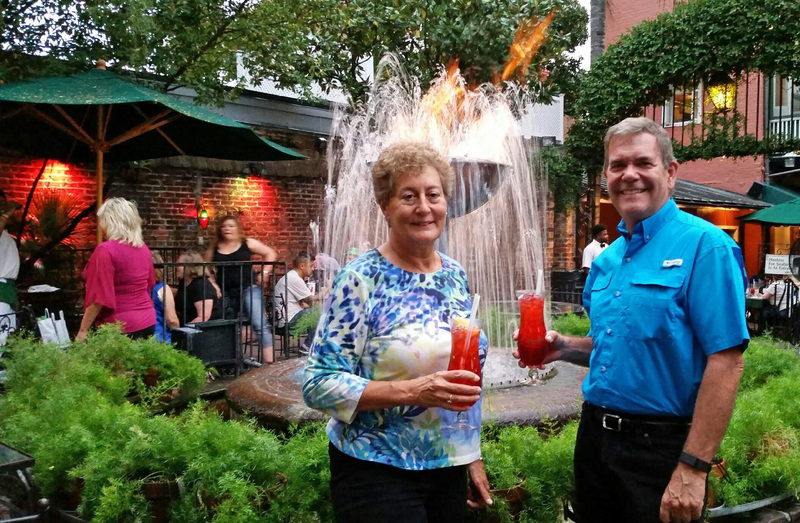 The hurricanes at Pat O’Brien’s were magical. Lots of choices along the Riverwalk, all of them good and reasonable. Generous happy hour specials, too. This was a very relaxed and friendly place to chow down and enjoy the people-watching. 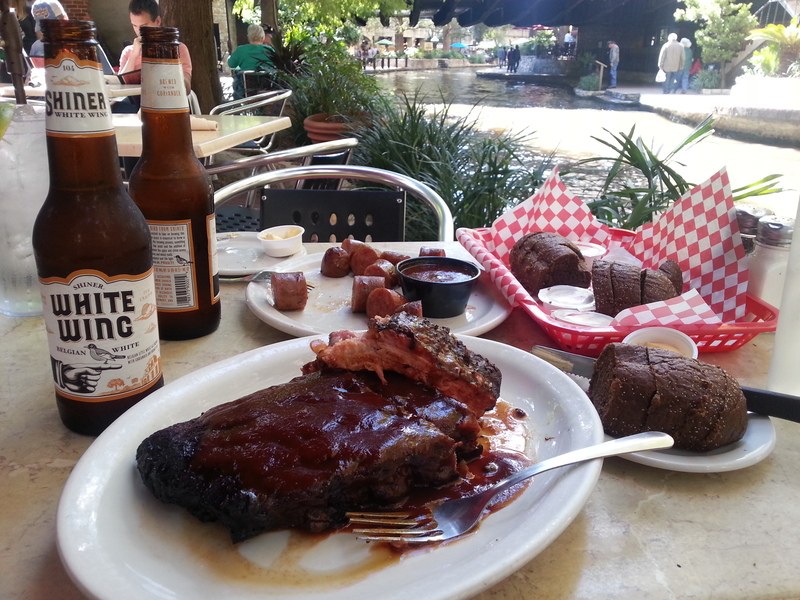 Appetizer ribs at Republic of Texas – very good barbecue. 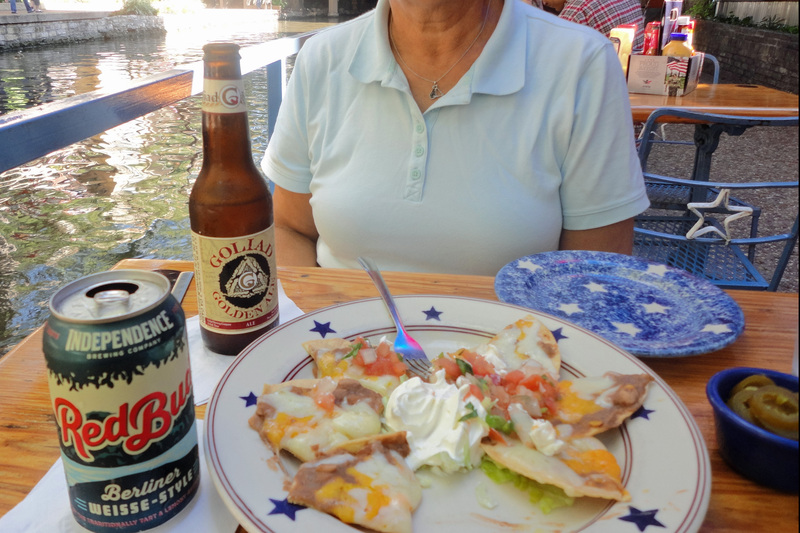 Nachos with local beer at County Line BBQ on the Riverwalk. 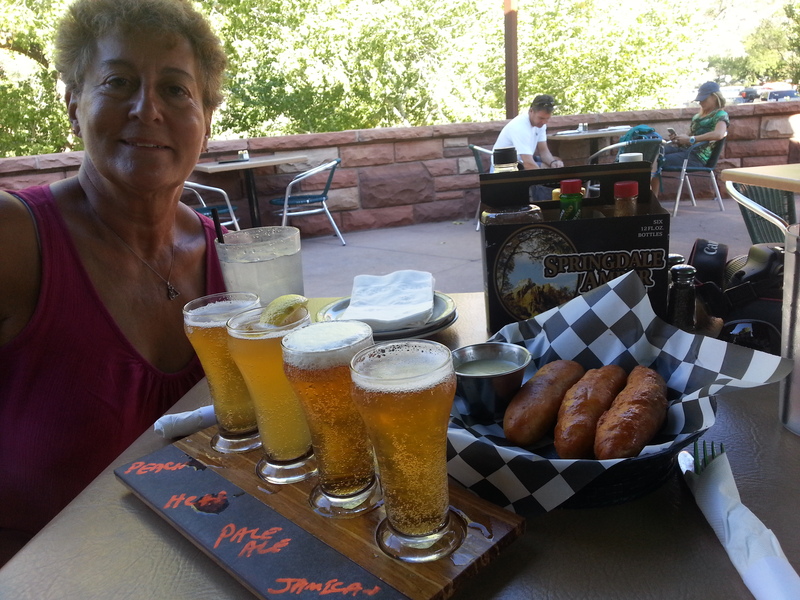 A nice lunch at the Arizona Room, Bright Angel Lodge, South Rim of the Grand Canyon. 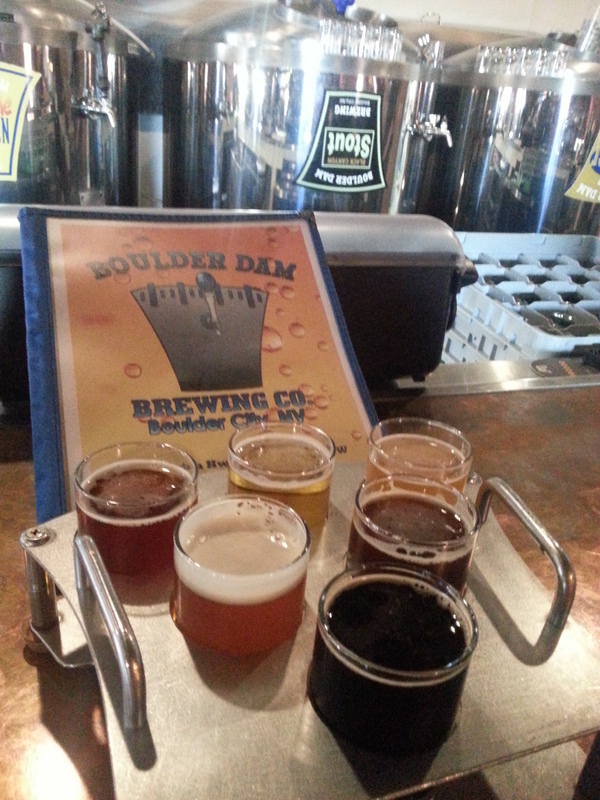 Near Hoover Dam there was an eclectic Boulder Dam Brewing company that was fun. At Zion’s nearby brewpub the pretzel sticks were delicious. 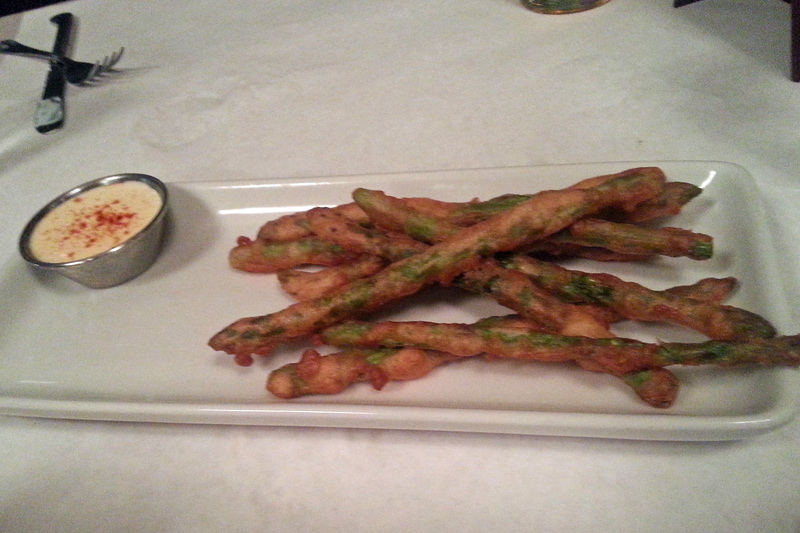 Enjoyed the fried Asparagus at the Ritz Grill downtown Colorado Springs. Also sampled at several breweries. 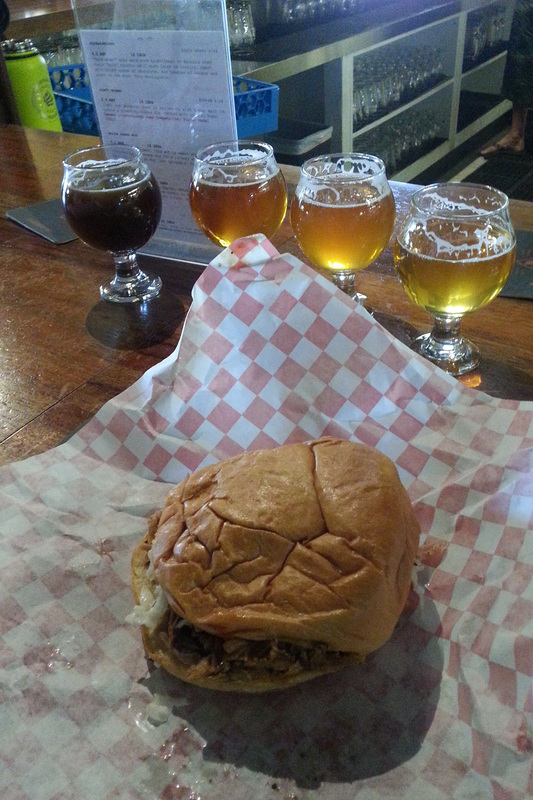 In Golden, we stopped at Mountain Toad Brewery and had a great pulled pork sandwich at the Barefoot BBQ food truck on site. Great beer, nice kick in the barbecue. Just had to check out the many breweries, large and small, in town. Square One Distillery was delightful. 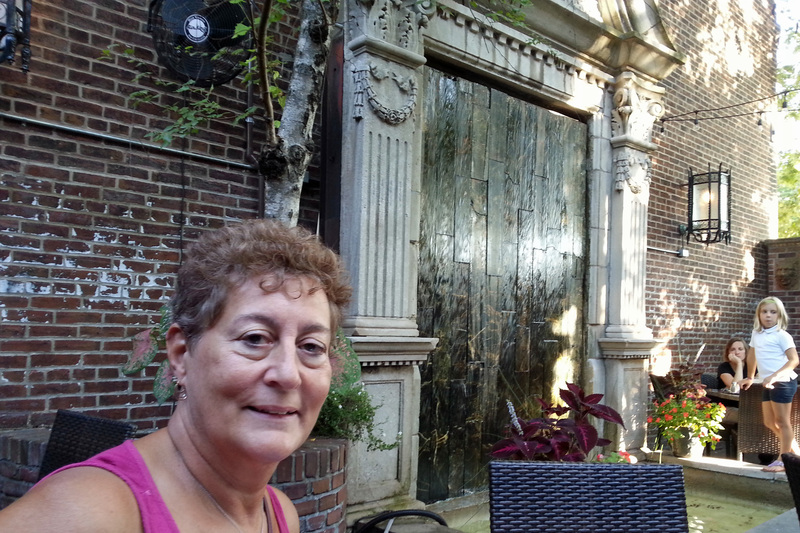 A nice outdoor courtyard was reminiscent of New Orleans and the area around LaFayette Park and the ‘painted ladies’ had the best vibe. Reminded us of a combination of Philadelphia, Boston, Savannah. The black and tan nachos were piled with flank steak and melted cheese that tasted so good. Doug ordered a Scotch egg, which was a hard-boiled egg inside pork sausage and deep fried, with their beer mustard accompanying. 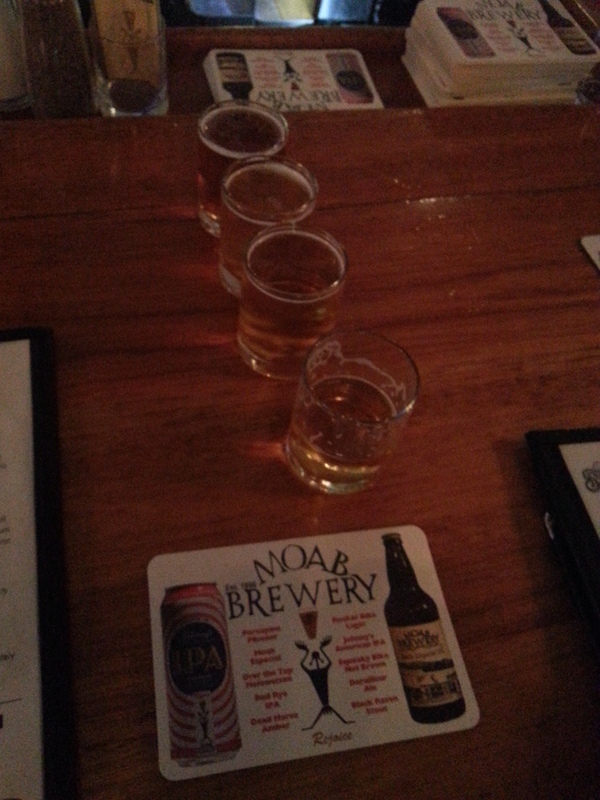 Of course the samplings of beer were all so good, it was hard to keep them all straight. Urban Chestnut brewery was a reconfigured auto dealership in another neat part of town. 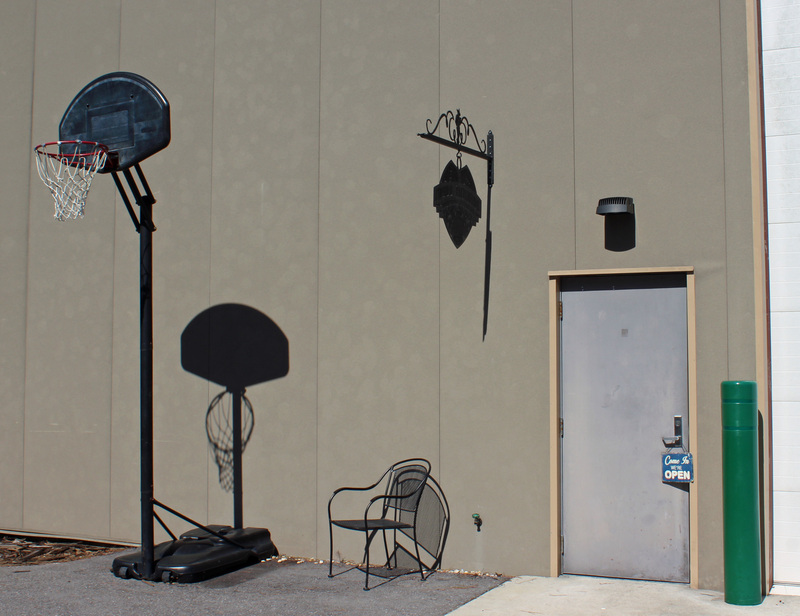 Their outdoor courtyard was ample, but less intimate than Square One. Again, the samplings were delicious, but after a while you had trouble with the nuances and minor differences, although these were all lighter, German-styled brews. 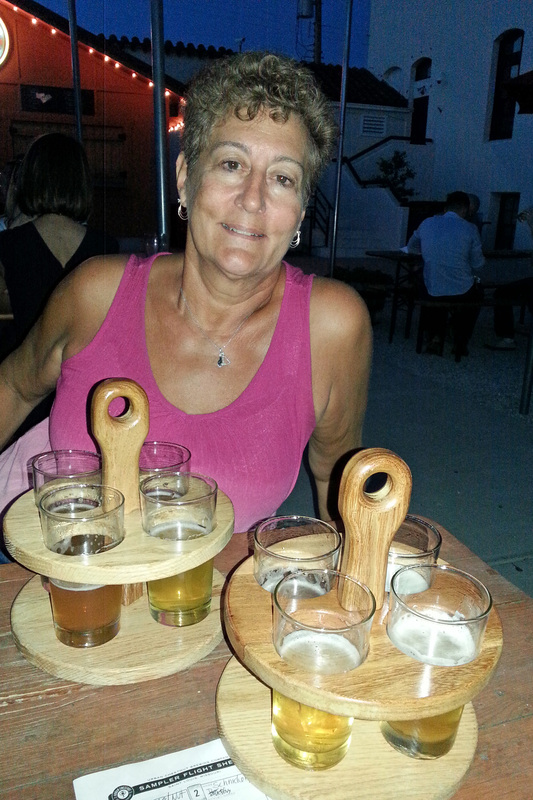 Jackie loved the hard cider. Four hands brewery didn’t have a large food selection, but the beer was impressive and the view from the bar into the brewing area was really neat. 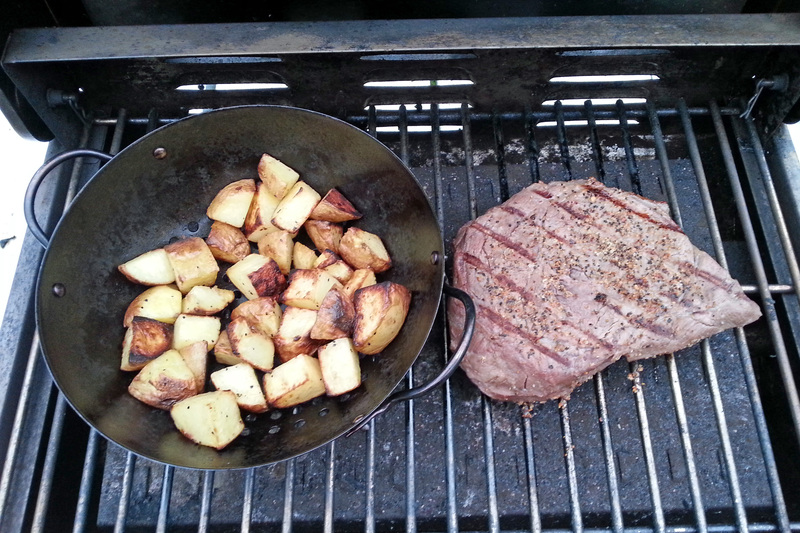 Since we missed out on our Kansas City steaks, the camp meal was ribeye and potatoes. 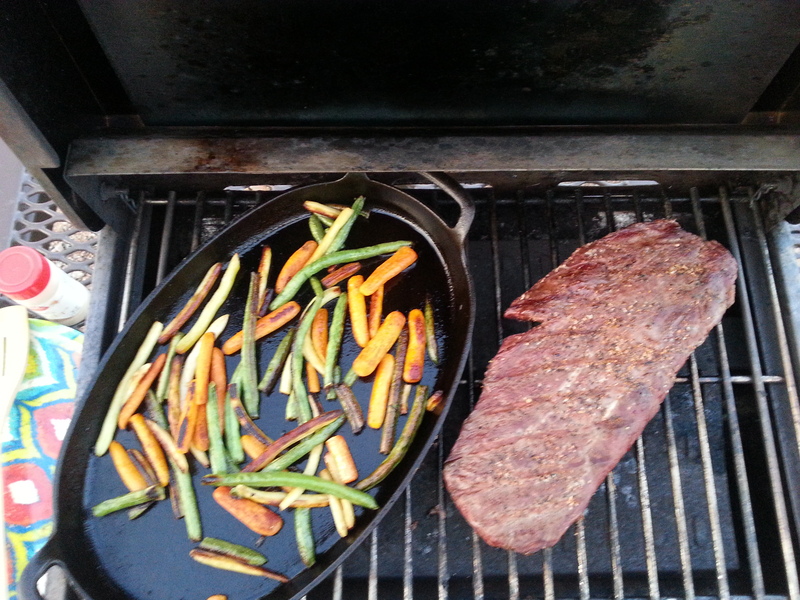 Even though it was raining lightly, the meal turned out perfect. Some Malbec was perfect pairing. 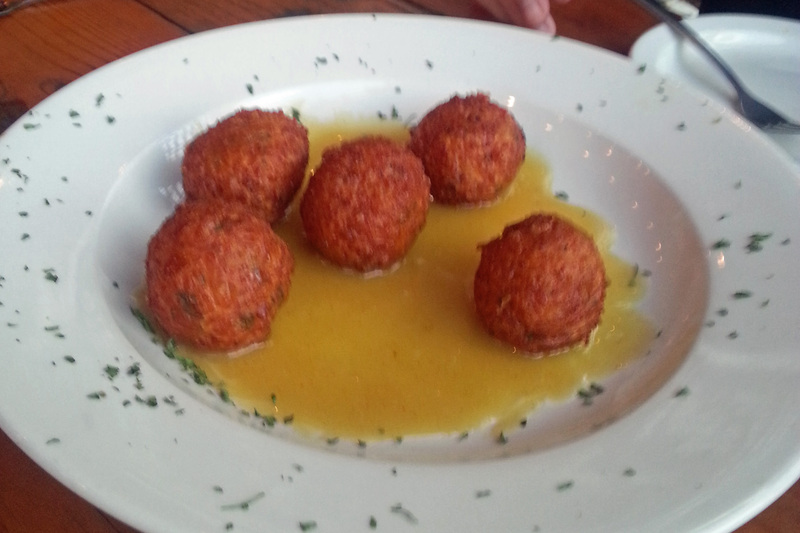 The cheese fritters with 5 kinds of cheese, BBQ rub and deep fried, in a pool of honey mustard sauce were definite winners. Spare rib platter was a generous half-rack that was all over my fingers and lips. 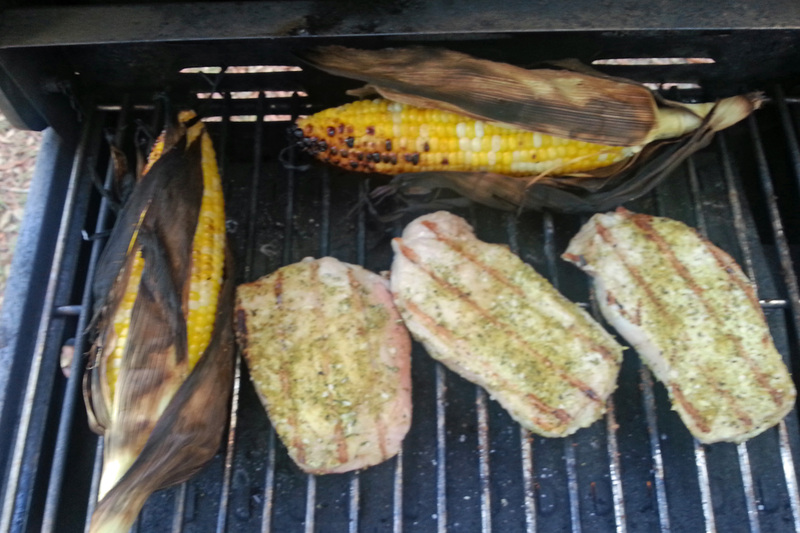 Very good, even the wedge of cornbread. I still liked the babyback ribs from Jumping Jacks, though. Spare rib platter at Memphis Barbecue Co.
As mentioned, the grouper sandwich at Sharky’s was the best of several we tried in Panama City Beach, washed down with some Shocktop. Great beachside location, too — a true beach bar. Flying Fish had good oysters and you watched them get shucked from the bar, but the calamari was too thickly sliced and a bit chewy. 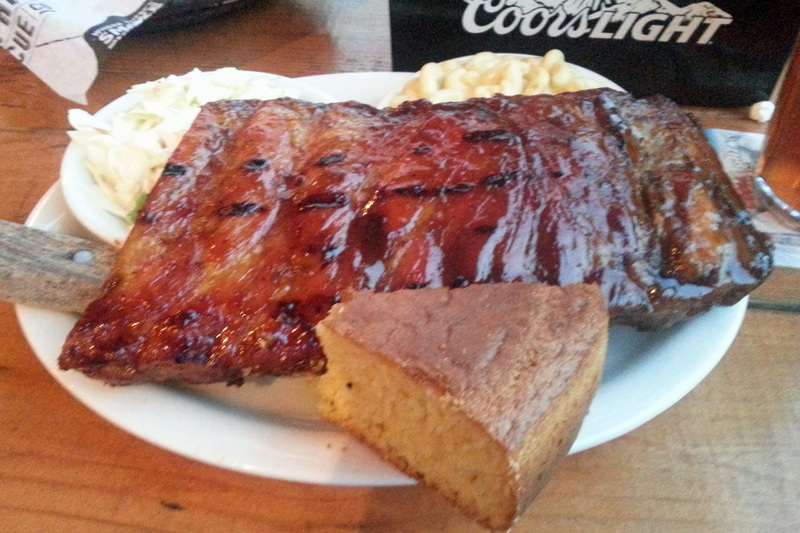 The babyback ribs were fall-off-the-bone yummy – quite a surprise for a seafood restaurant. Happy hour pricing, too. Congratulation, happy retirement and enjoy your travel and food! I have retired since 2003 and still going strong with my travel and photography – the best time in my life! Thanks. Been trying to get better with my photography as we travel along. Really admire some of the shots you captured. Darn birds and beasts just don’t wait for you to get the settings just right!